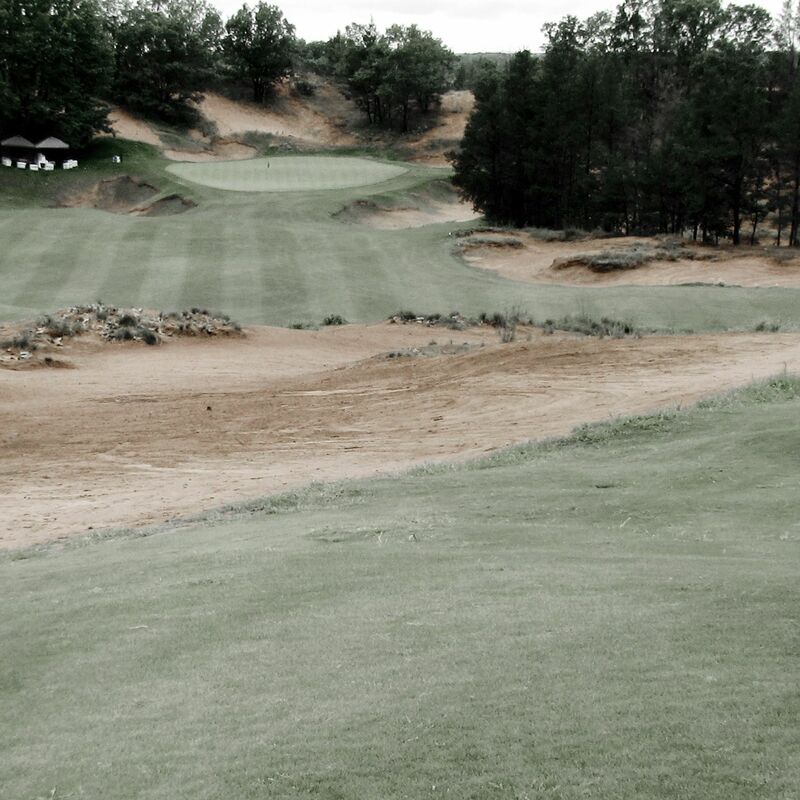 This year’s Illinois vs. Wisconsin Writer’s Cup was a long-anticipated match-up for many reasons: To start, Illinois has had our number for a few years, but most importantly it was to be held at the world’s most exciting new golf resort project, Sand Valley Golf Resort in Rome, Wisconsin. 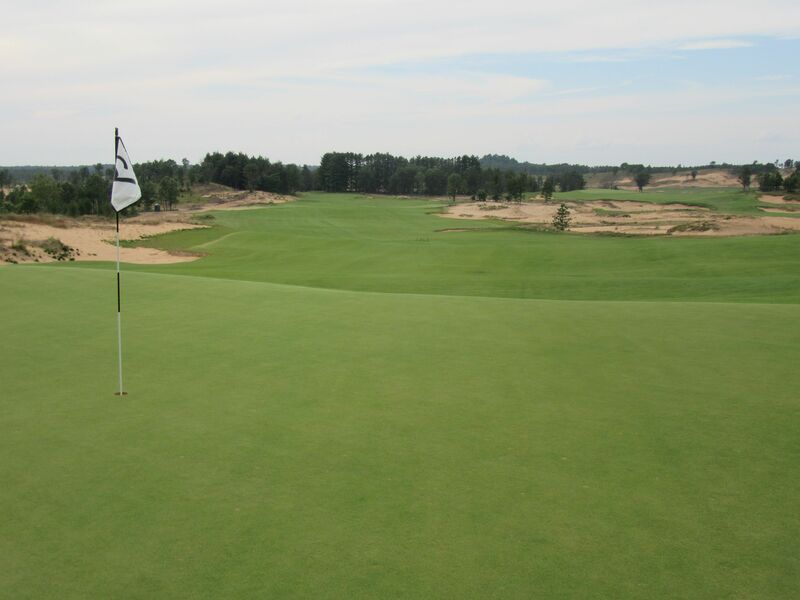 I put up a preview of the front nine at Sand Valley after last year’s Media Day event here, and was unbelievably excited to see how things have grown in and especially to check out the back nine and lodging. The back nine was everything I’d hoped it would be: More fantastic par threes and one great golf hole after another. 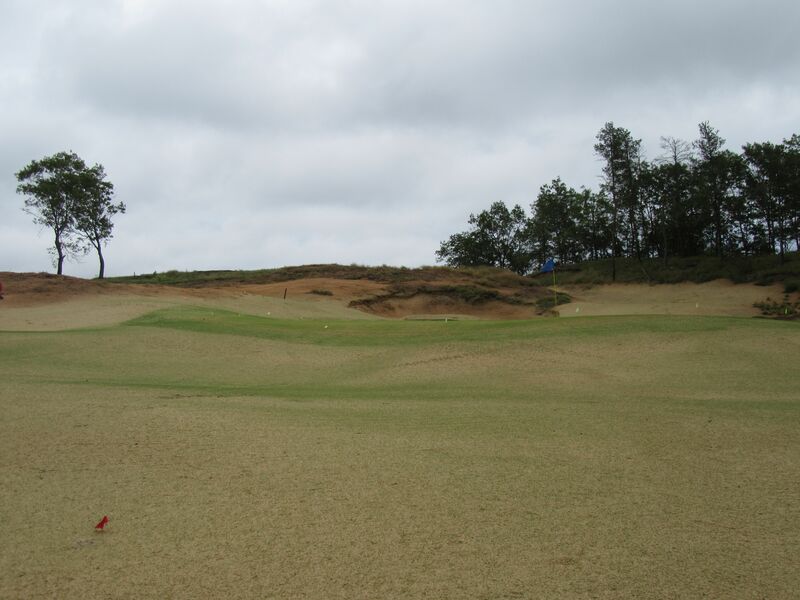 Strategically placed sand traps, tricky greens and conditions that far exceeded what can be expected of a course that was seeded this Spring blew away everyone at the event. 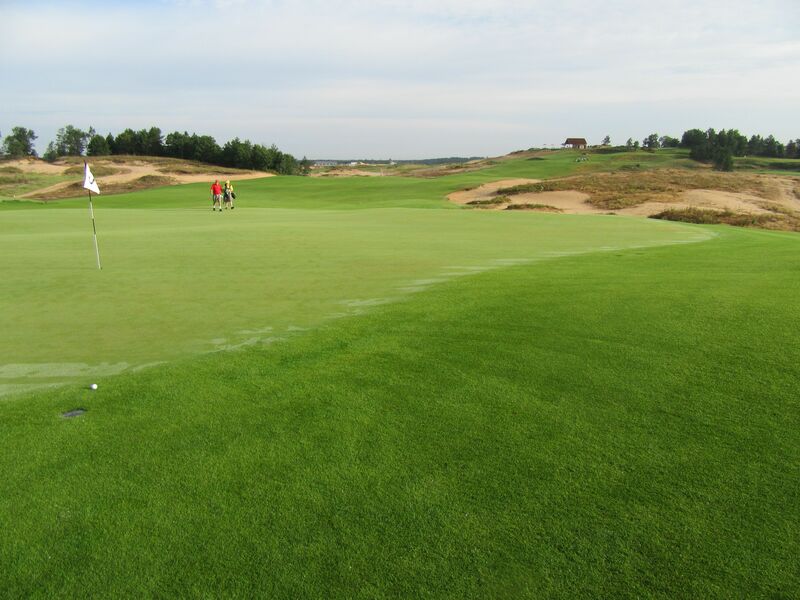 Sand Valley has been blessed with one of the best two growing seasons in recent history. Weather in the Midwest has been mild, the winters [relatively] short and all the ingredients to be well ahead of its time just sort of fell in to place. 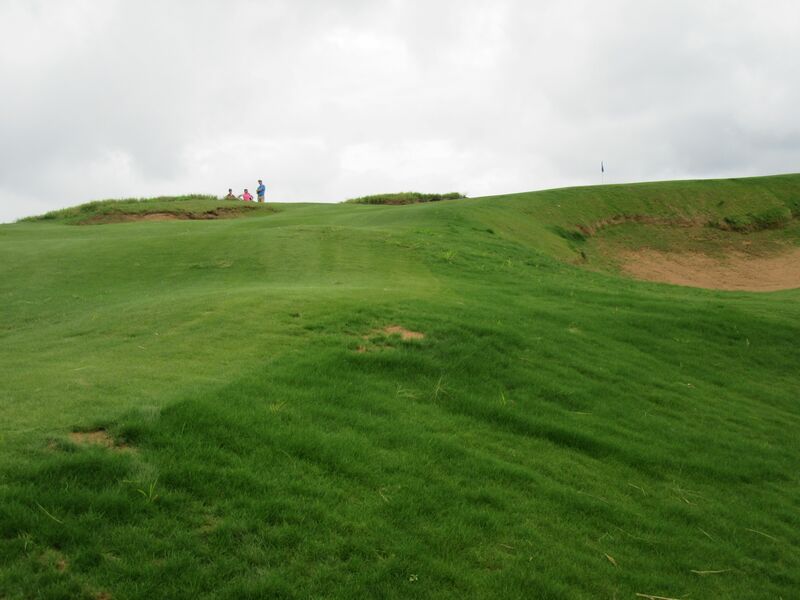 The initial plans for the course, in fact, were to have 13-15 holes open for preview play by the end of 2016, and already all 18 are and will undoubtedly become even more spectacular for its public unveiling in June, 2017. The David McLay Kidd course is coming along nicely, too, with a number of holes already seeded and growing in beautifully. I unfortunately did not have time to tour it during this trip, so I can’t wait for my first thorough look at it next season. 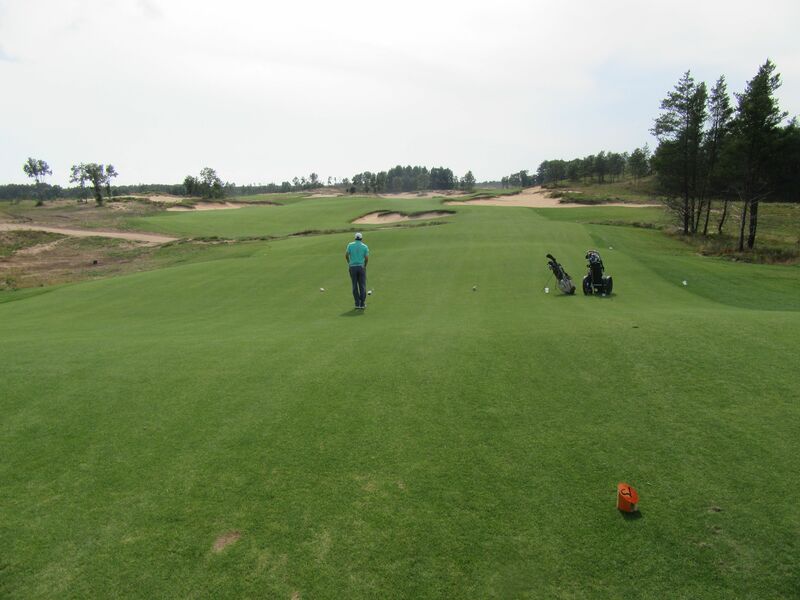 I reviewed the front nine at Sand Valley in my original article from last year’s media day, linked here, so I will just include updated photos this time around with minimal commentary. The Writers Cup alternates between Wisconsin and Illinois courses each year, with last year’s event played at the challenging Chicago Highlands Club. Team Illinois has had the best of Team Wisconsin for a few years straight, including a rout at the Chicago Highlands Club last year. This year, though, the red team was back on our own soil at the world’s most highly touted upcoming golf destination, and there was no way we were going to lose. Not there on what we were told was the first event to be played on all 18 holes of the Coore/Crenshaw masterpiece. 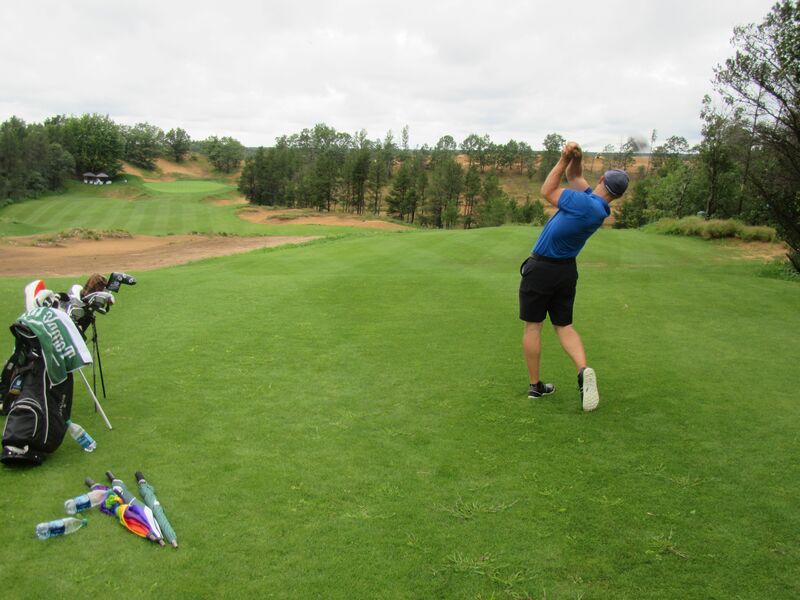 Sand Valley and KemperSports were fantastic hosts, and both teams made the pilgrimage to Rome, Wisconsin on Monday for practice rounds prior to the tournament teeing off at 7:45 Tuesday morning. 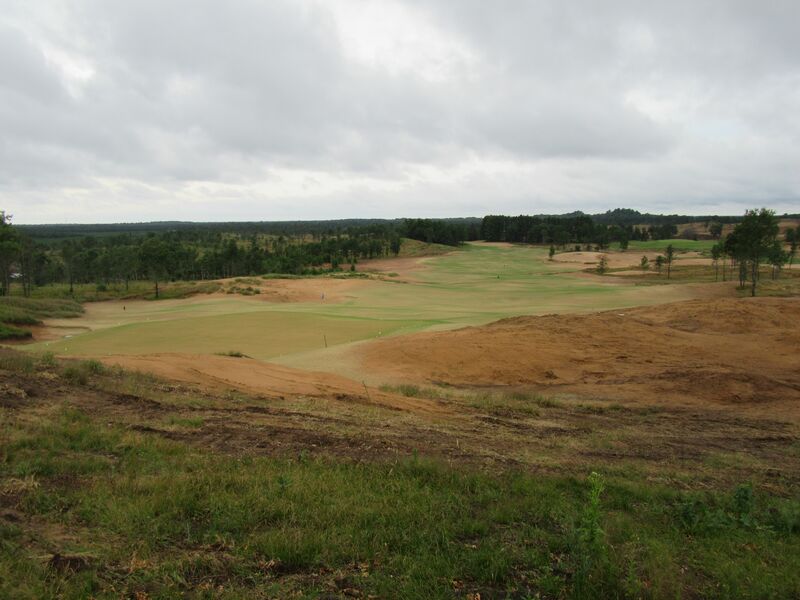 The contrast between where the Coore/Crenshaw course is now versus where it was last August is almost unbelievable, but with two of the greatest growing seasons ever it is almost unnecessary to say that Sand Valley’s progress is well ahead of schedule. At no time did they intend to open all 18 holes for preview play this season, but alas on September 1 it is happening. 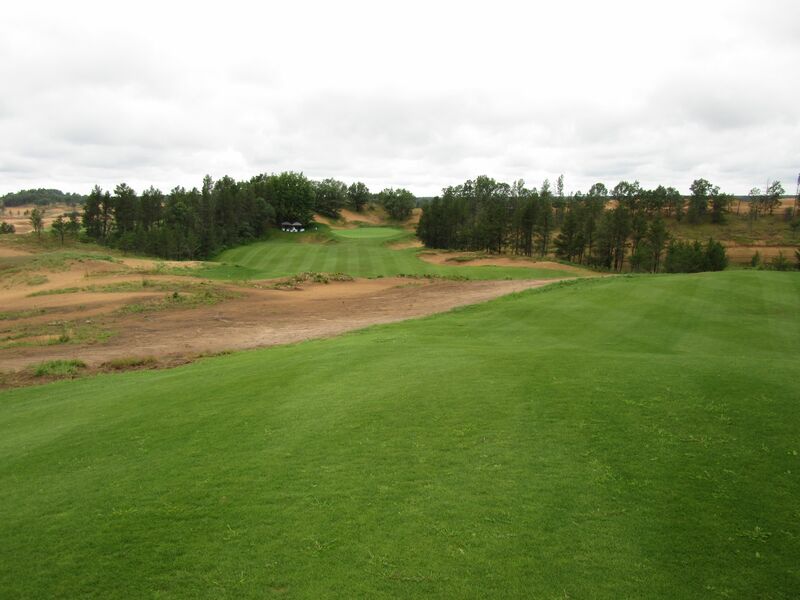 My first ah-ha moment during my first trip to Sand Valley last year was arriving at the top of “The Volcano” and seeing the first hole below, seeded and beginning to grow in. 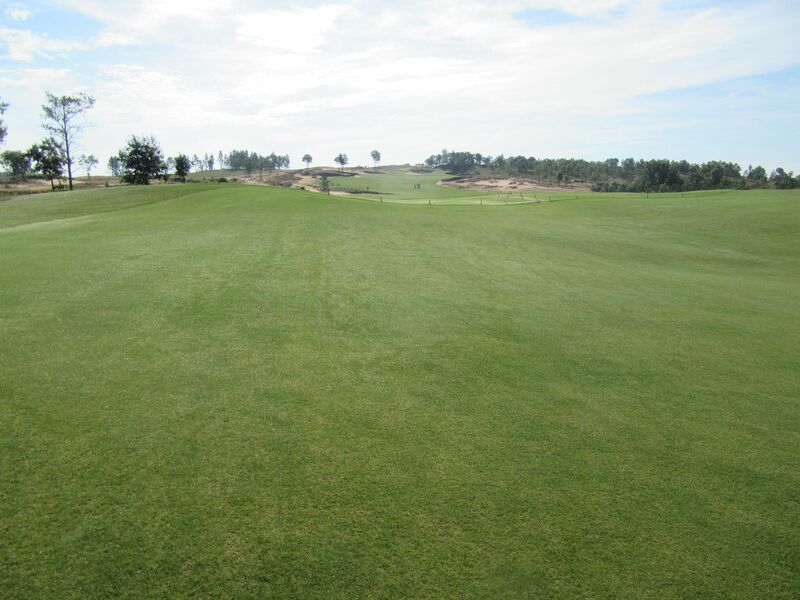 It is fully developed at this point, as are the magnificent tenth and 18th holes. 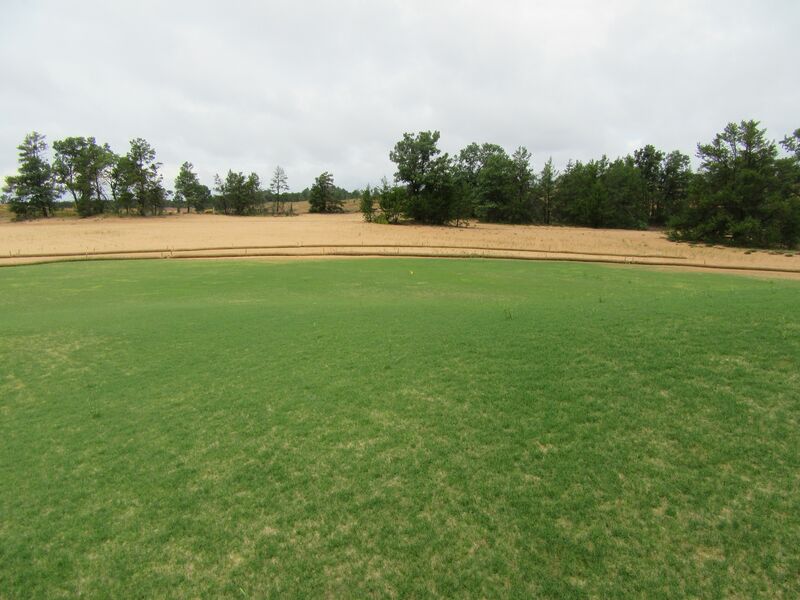 The start of a driving range is also coming in left of the first fairway, and most of the course’s holes are visible from this highest vantage point on the property. The vista here outside of “Craig’s Porch” is comparably as spectacular as the view from the porch at Pacific Dunes (at Mike Keiser’s original golf resort, Bandon Dunes, on the southwest coast of Oregon). Glen Turk of Midwest Golfing Magazine and I met up on Monday to play the front nine before a dinner at Craig’s Porch (named after Craig Haltom of Oliphant, who originally discovered the land) that consisted of buffalo burgers, Johnsonville brats and sides. Accommodations in the Lake Leopold Cottages were everything I hoped for and was told to expect during last year’s Media Day with Mike Keiser, Jr. and Bill Coore: “A comfortable bed, nice shower and a big bar of soap” … And fantastic views. The rooms are very well appointed, and I am told by this time next year the color of the cottages should blend in perfectly with the color of the sand that surrounds it. The morning match-ups got started at 7:45 and my first round match was with my partner for the first two rounds, Rob Schultz. Rob and I had a first round best ball match against Teddy Greenstein of the Chicago Tribune and Steve Schapiro of WGN-TV. 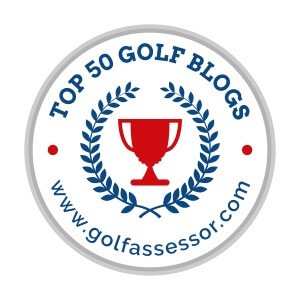 For the first couple of years I wrote my blog, I did a write-up at the end of each year to put the season in to words, and to commend the courses I felt were the best that year in multiple categories. As my site has continued to grow, this has become less academic, especially since I joined a private club a few years back and am obviously playing a much smaller sample of different courses each season. It doesn’t hurt to write a little review, though, especially for my own pleasure to look back at in the future at what was the golf season of 2015. The winter of 2015 extended a little longer than normal, with most golf courses opening in early April. This was a couple weeks earlier than in 2014, but months behind some years. I am already praying that 2016 will see course openings back in the February timeline again… Fingers crossed. With last night’s first snow of the Winter, I figure this is as good a time as any to wrap things up… Not that I won’t be out there if/when the weather warms up and the grounds are healthy enough to play! Most of my rounds this year were played at my home course of North Hills Country Club, which under the tutelage of Randy DuPont was in exceptional shape again all year round. My season was a roller coaster of sorts, starting out with an index of 12.1 and getting down to 9.0, shooting consistently for a while in the low 80’s. Then I became a bad nine, right around September first, shooting 87-89 and losing money in my Saturday games. In games where the total monetary payout ranges from $3-5, I actually lost $45 one day. Ouch. 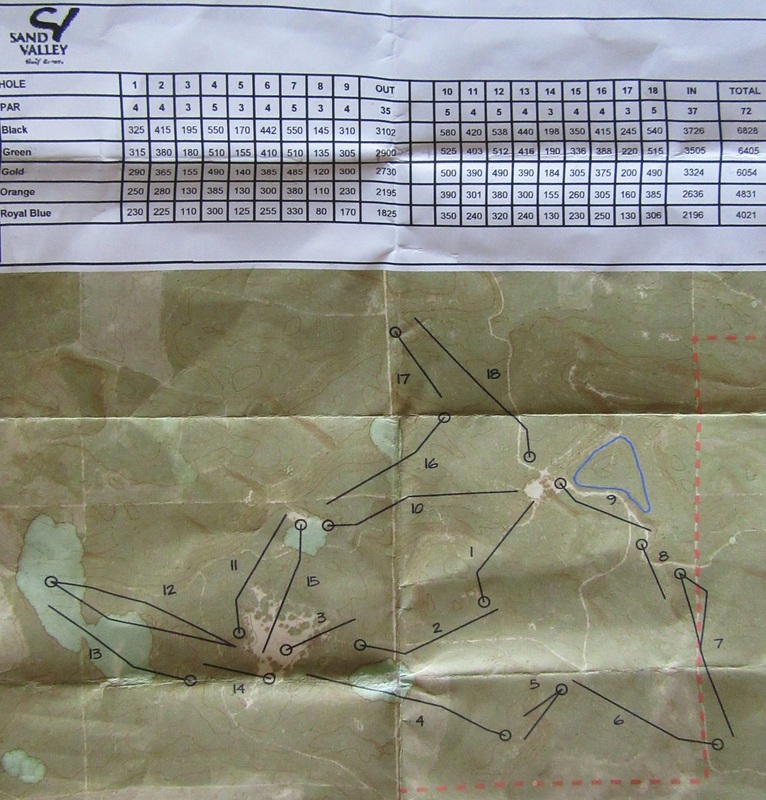 That is enough about my game, though – what about the courses from 2015? Rated the number two public course by Golf Digest, number two modern course by GolfWeek, and number one public course in the country by Golf.com, Pacific Dunes is coastal golf at its very best. Designed by Tom Doak and opened in 2001, Pacific Dunes blends perfectly rugged Bandon landscape with ingenious hole layouts and execution. Just a few years old, the Red course at Streamsong has already amassed an incredible number of accolades, including the number 18 public course in the United States. 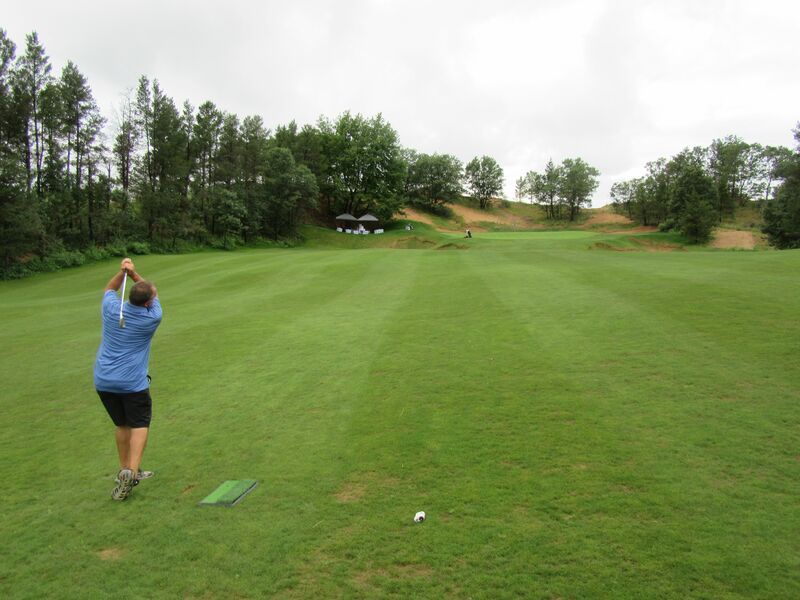 In 2013, Oliphant Vice President of Golf Management and Project Development, Craig Haltom, contacted Mike Keiser about a piece of land in remote Central Wisconsin that he just had to check out. Keiser, the prolific developer behind Bandon Dunes, Cabot Cliffs and other ongoing international golf resort projects, works closely with the Wisconsin-based Haltom and trusted his opinion enough to travel to Rome, Wisconsin to see Haltom’s can’t-miss property. The Keisers wanted to hate it. They wanted to give it a fair shake and quickly dismiss it as a location that could not house one of America’s great golf destinations. When they stepped on site, though, what they found was densely forested sand barrens covered in mature jack pines and sand that Haltom promised reaches depths of 200-plus feet below. Mike Keiser wanted to walk away, but he couldn’t. “The last I remember, there is no ocean in Wisconsin,” golf course architect Bill Coore told him prior to seeing the land, himself. 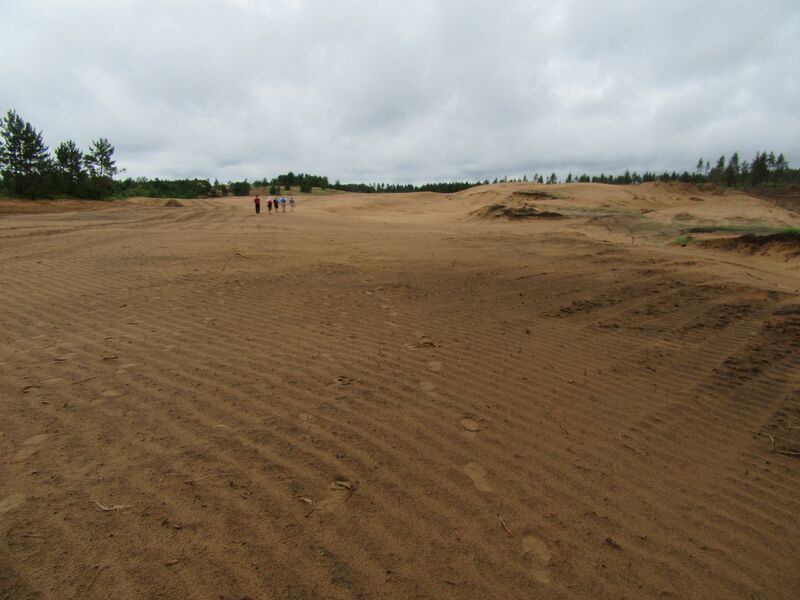 While Sand Valley does not have an ocean per se, it does have one of the deepest natural sand basins in the country – a result of the glacial Lake Wisconsin that drained in a single catastrophic event many centuries ago. 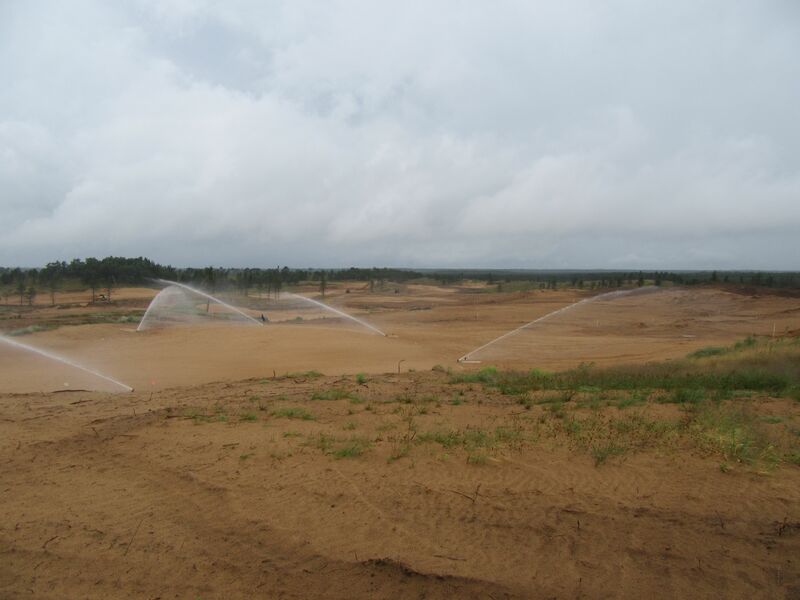 This land parcel has a sand foundation as good as any in the world. Great contours? 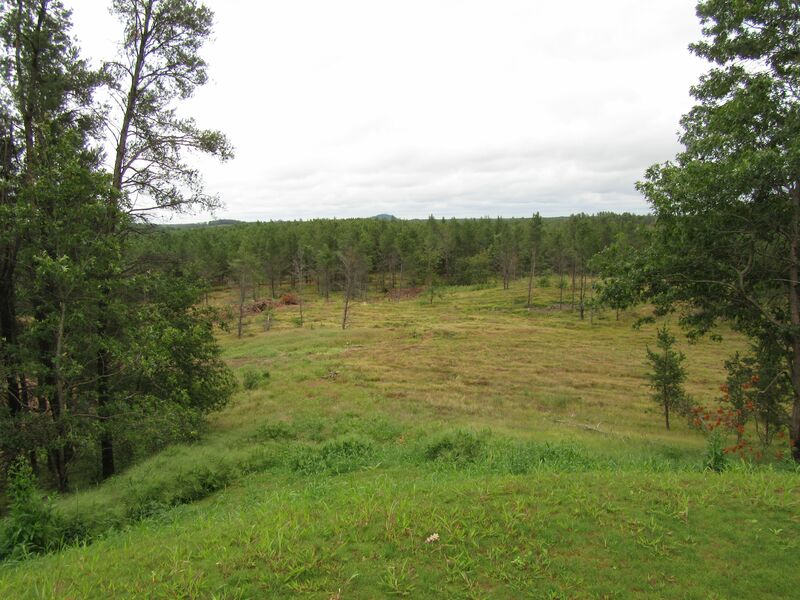 The jack pine oak savanna that Sand Valley will inhabit rises and falls like tides. The land looks and feels like it belongs thousands of miles from where it is, maybe in the Sand Hills of Nebraska, or the ranges of Montana, but certainly not in Wisconsin. Fabulous contours? Check. 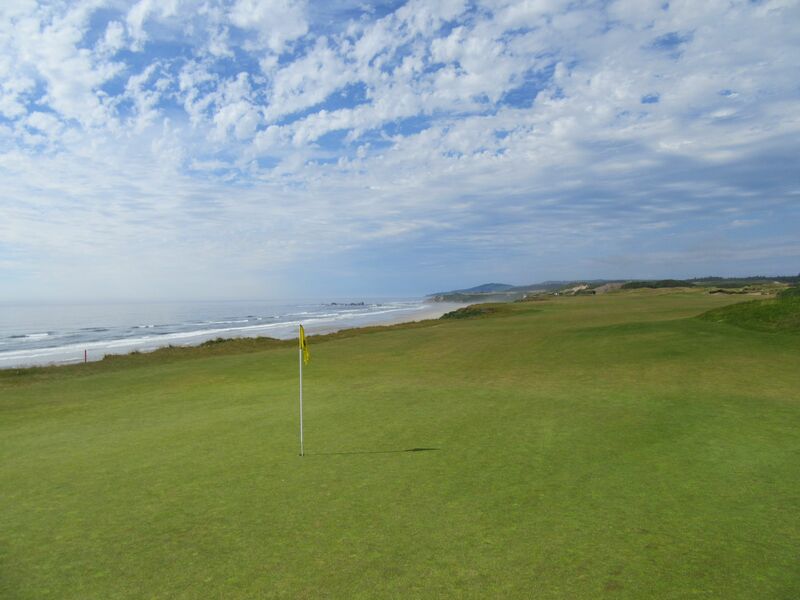 It was time to find a course design team who could make the very best of this epic piece of land, and for that Keiser went to his old friends at Coore & Crenshaw, golf’s preeminent design team with whom he’s worked together at both Bandon Dunes and Cabot Cliffs. Not only do they have a history of making legendary, pure golf experiences, but Coore/Crenshaw is the world’s greatest design team for working with the land and creating unique, memorable courses. Keiser purchased the land quickly. 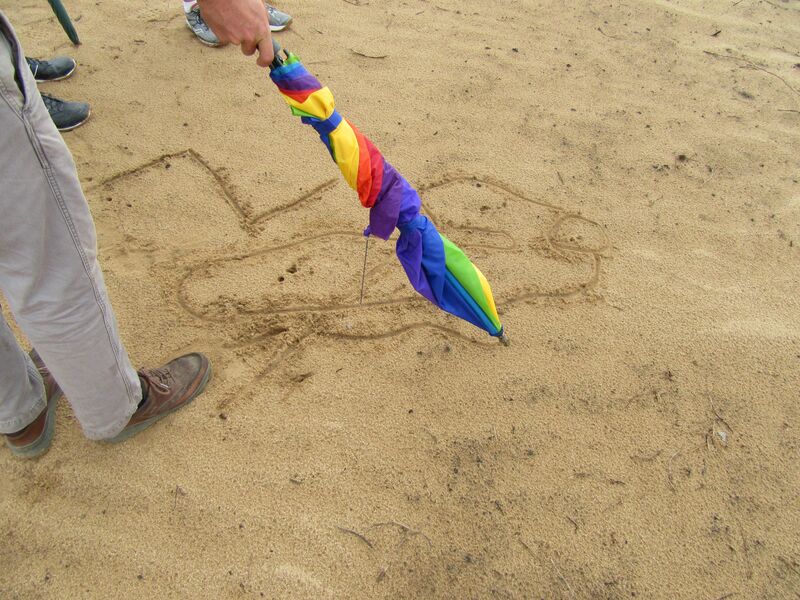 Sand Valley was born. The entire golf world took notice. The Wisconsin state and local governments, along with the Department of Natural Resources, have worked hand in hand with Keiser’s development group throughout the early stages of the project, and environmental agencies jumped on board even when some argued the removal of so many red pines could have adverse affects on the area’s ecology. What the DNR, the Chicago Field Museum and others became enamored with was not a tree removal program to create a business, but rather a gigantic sand dune habitat restoration project. The Chicago Field Museum, led by Jens Jensen, identified it quickly as an opportunity to undertake one of the most expansive sand barren ecosystem restorations in modern history. 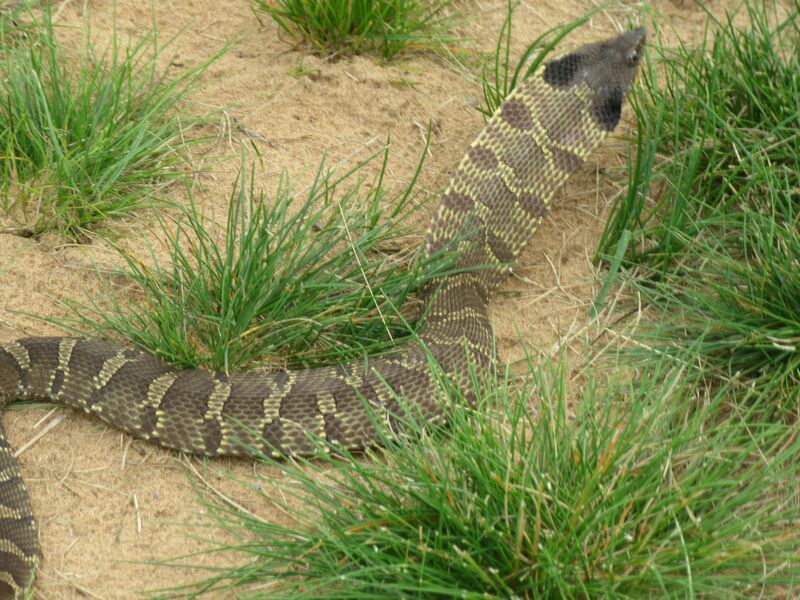 They even surmise that, if and when successful, Wisconsin and the Midwest could see the return of animals like elk and even lizards, cactus and other desert life that barely exist in the environment currently. 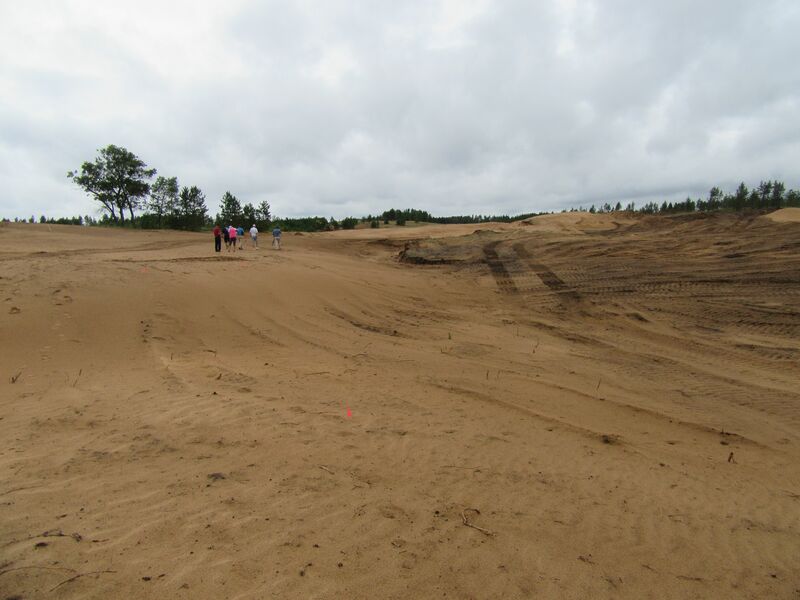 Environmental groups hope the Sand Valley project will be the first of many natural restorations of this type, which to date have gone largely untried. Not only is the project great for the environment, but it could also mean fantastic things for the local economies of Adams and Wood counties, not to mention the state of Wisconsin. Keiser’s projects have resulted in tangible economic prosperity to their geographic areas. Bandon Dunes, for example, is the number two provider of jobs in Coos County behind only the area hospital. 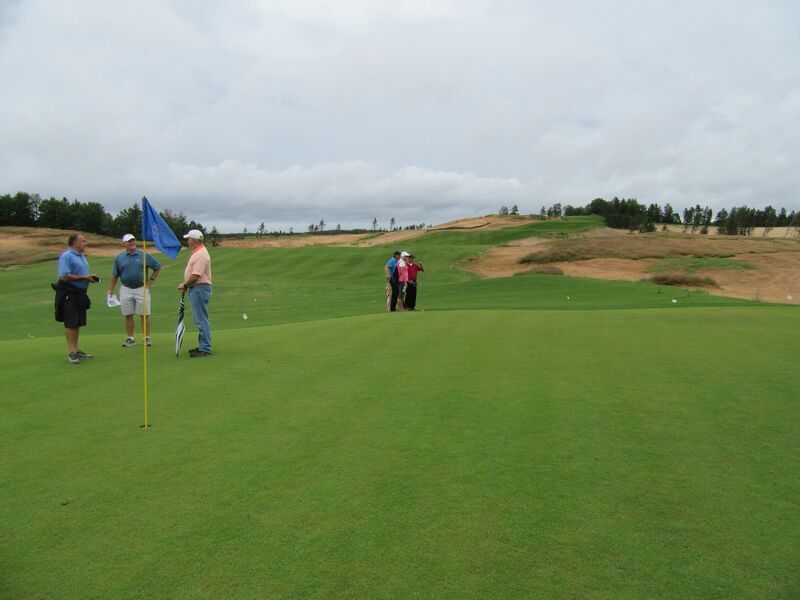 They are seeing similar results in Inverness, Nova Scotia, where Cabot Cliffs recently opened as the second course at their Canadian golf resort. Sand Valley’s Project Manager, Michael Keiser, Jr., joined us for Monday’s media day event, and was unequivocal that the team’s number one goal for the community is to become Adams County’s number one employer. There will be approximately 160 employees when the resort opens in 2017, and an additional 100 will be added for each subsequent course (the 1,700-plus acres of land can hold as many as five or six). To Adams County, with over nine percent unemployment and a median family income nearly $15,000 below the national average, the prospect of additional jobs, tourism, and national/state exposure is being met with open arms. 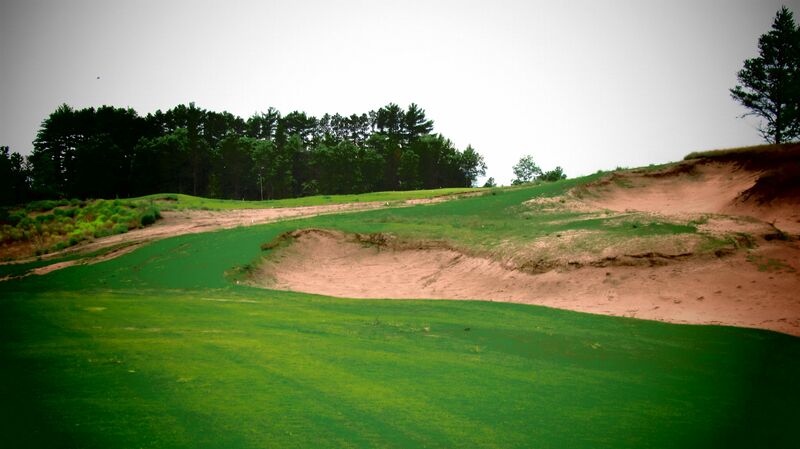 The addition of the Sand Valley Golf Resort will also mean great things for the Wisconsin golf community, in general. 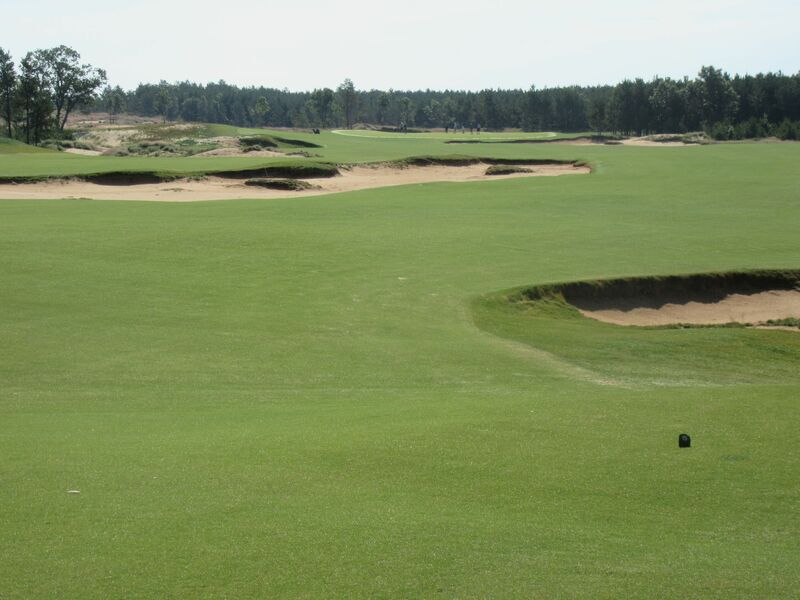 SentryWorld, the state’s original golf destination that opened in 1982 and recently underwent a massive Robert Trent Jones, Jr. renovation, is just 45 minutes from the Sand Valley site, while Northern Bay and it’s famous replica Castle Course is within 25 minutes. 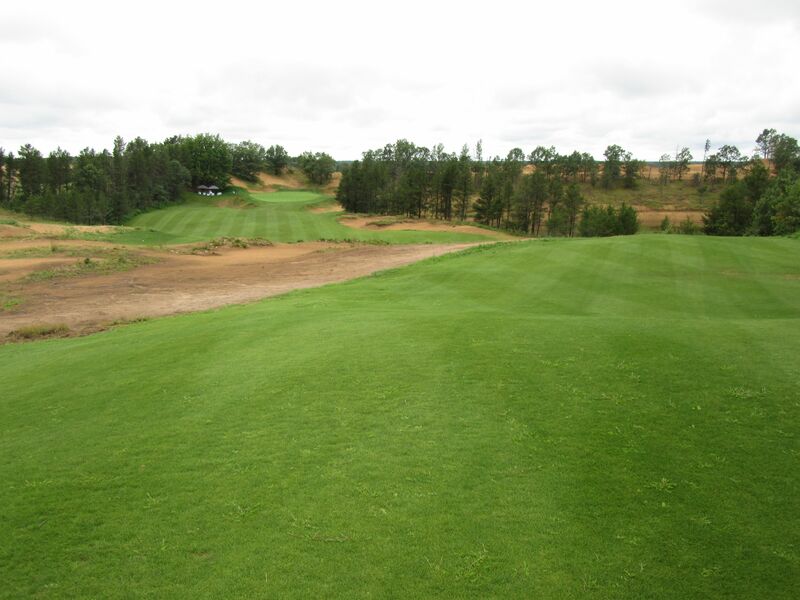 Lake Arrowhead’s Lakes and Pines courses are on the adjacent property to Sand Valley, and the now semi-private Bull’s Eye Country Club is within a 20-minute drive in nearby Wisconsin Rapids. 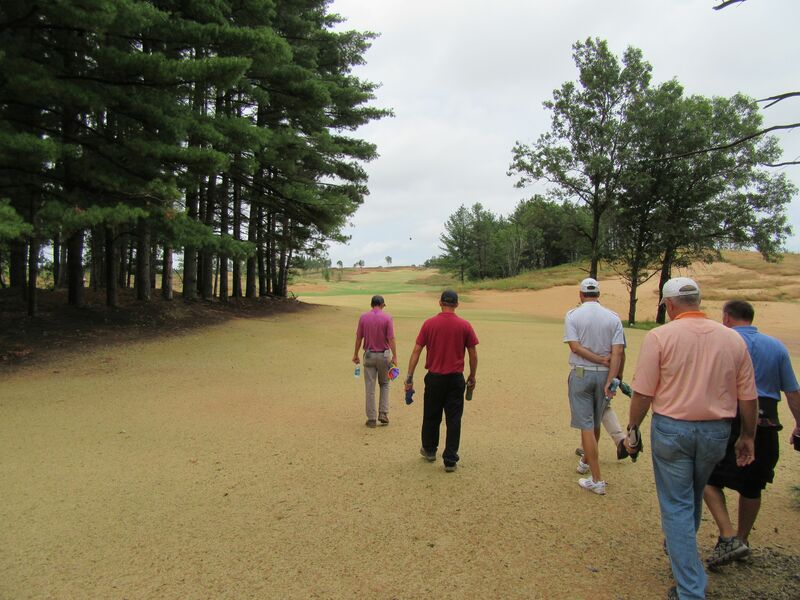 Area courses reached out to the development group eagerly, and preliminary conversation has started on a potential Wisconsin Golf Trail that could outshine anything currently marketed in the United States. 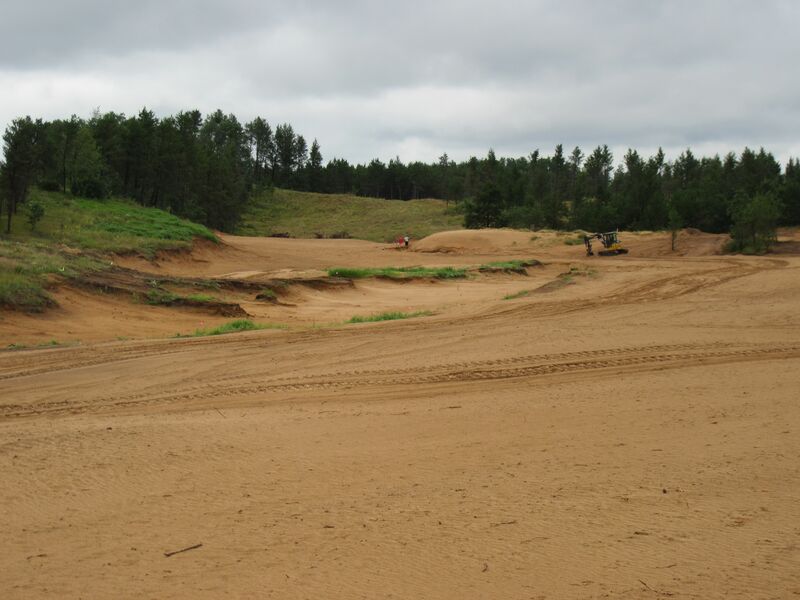 Golf experts familiar with the project predict that Sand Valley’s first course will open as a top ten track in the United States. Several have ensured me it will open in the top ten in the world. 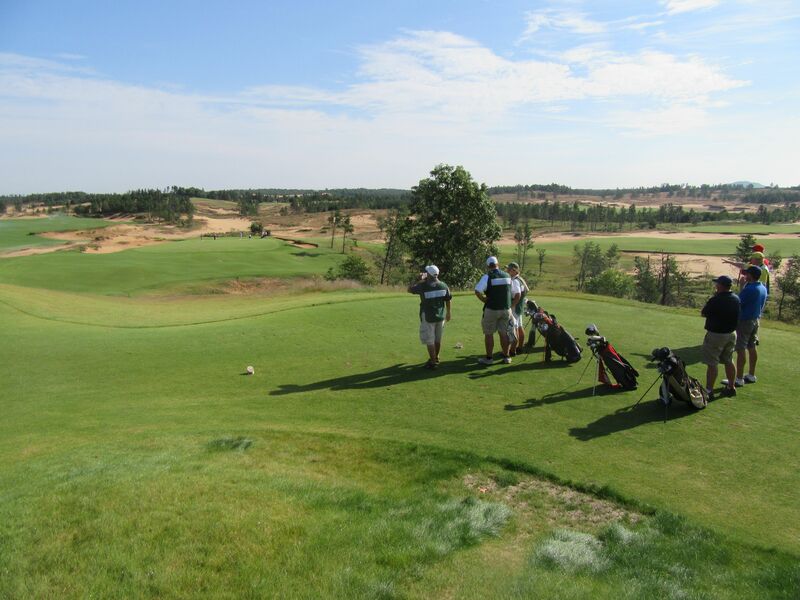 Combined with state powerhouses Whistling Straits, Blackwolf Run and Erin Hills, Wisconsin’s reputation as one of the world’s best summertime golf destinations will surely continue to rise. Coore/Crenshaw has designed all kinds of golf courses, from coastal (ie: Cabot Cliffs) to links (ie: Sand Hills Golf Club), to woodlands (ie: Bandon Trails), to desert (ie: The Saguaro course at We-Ko-Pa), to tropical (ie: Kapalua’s Plantation course), and plenty of others that rank in the country and world’s top 100. Variety is the spice of life, though, and for Coore/Crenshaw it’s about taking a great location and doing the best, most creative work they can on it. 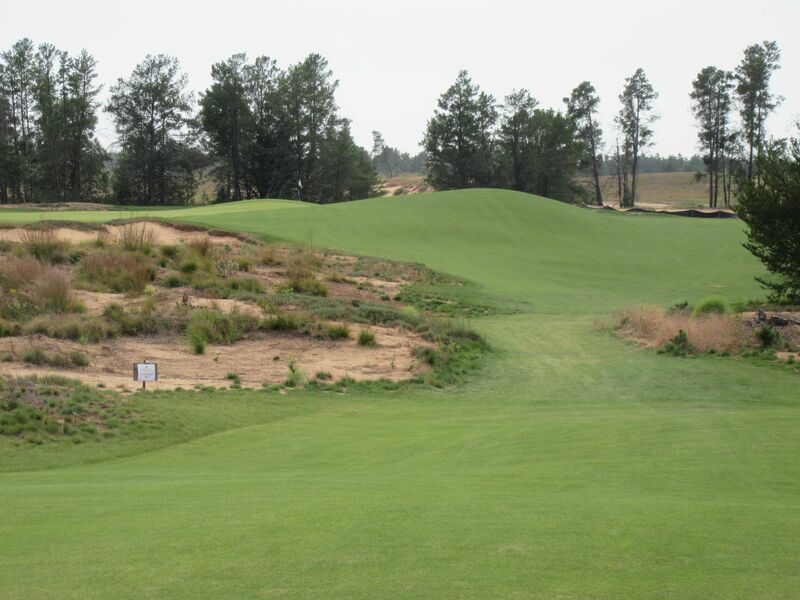 There was significant pressure with Sand Hills, for example, as well as with Streamsong, Friar’s Head and others. The pieces of land they were entrusted with at these locations were so stunning that anything but their best would inevitably be met with disappointment. 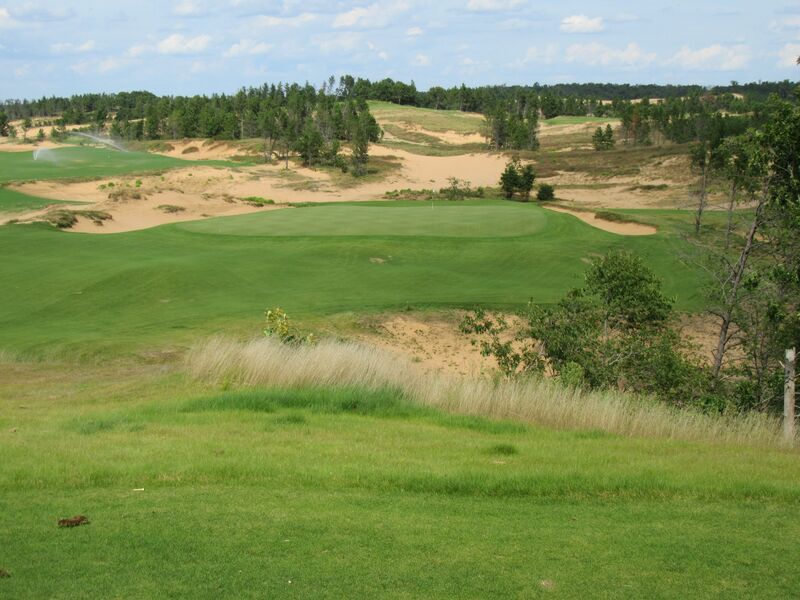 While Sand Valley offers land “THAT good,” it also provides the spice that Coore and Crenshaw desire: It’s unique. 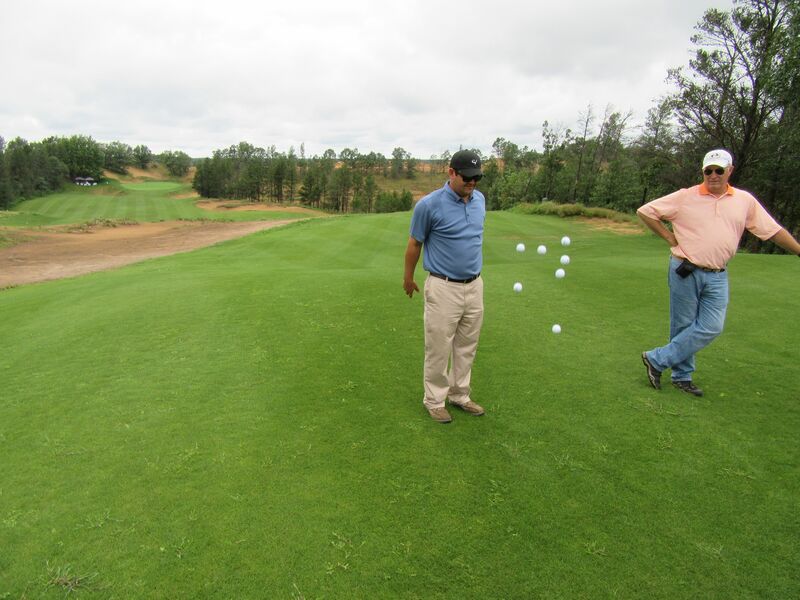 While writers have likened the site to Pine Valley, Cypress Point, Pinehurst and others, Bill makes it clear that Sand Valley is different. 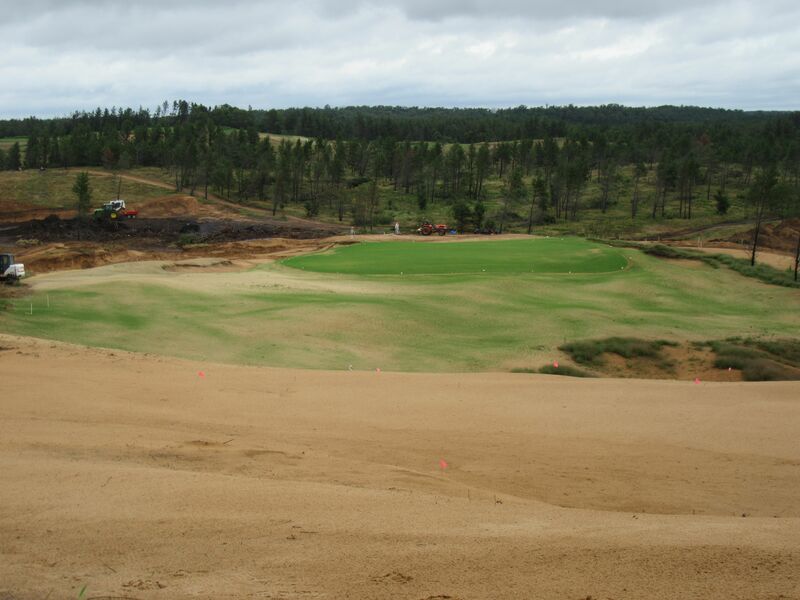 Golf enthusiasts (including me) love to define courses, architects’ portfolios, styles, regions and so on… So what will Sand Valley be? Sand Valley is not Pine Valley. It is not Pinehurst, and it is not Cypress Point. Sand Valley will be Sand Valley. It will be fast, it will be unprecedented, and it will be spectacular. 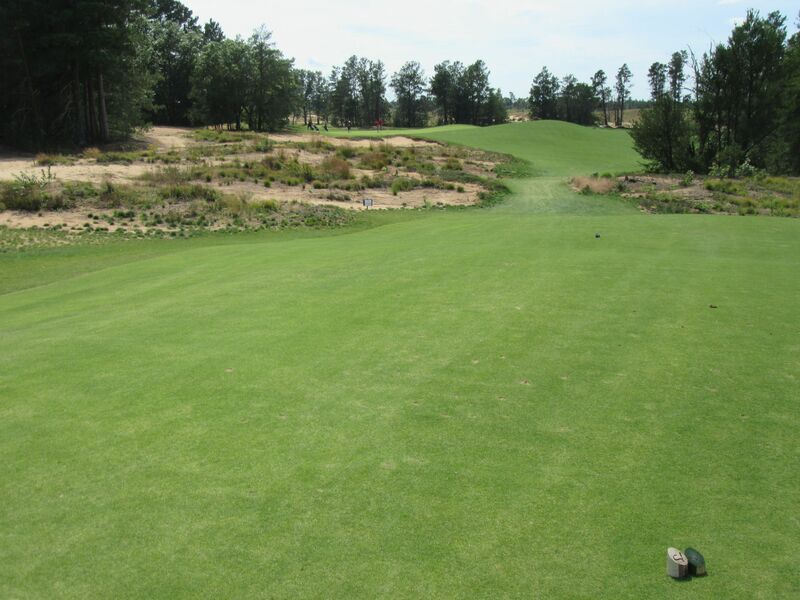 If you need to categorize it, the nearest possible course category is heathland. Heathland courses, primarily in Great Britain, are maybe a 75/25 to 95/5 mix between links and parkland styles, are typically flush with gorse and heather (vegetation that grows in open soil), are heavily contoured, and while they do have some trees are primarily open land that encourages golf to be played on the ground. While Wisconsin does not have heather (hence, “Heath”land) or gorse (the Bandon Dunes complex in Oregon is the only known location in the United States where gorse is considered to be native) like traditional heathland courses, it is rife with jack pines and a variety of “Wisconsin Desert” vegetation that is considered to be locally unique to the Sand Valley region. 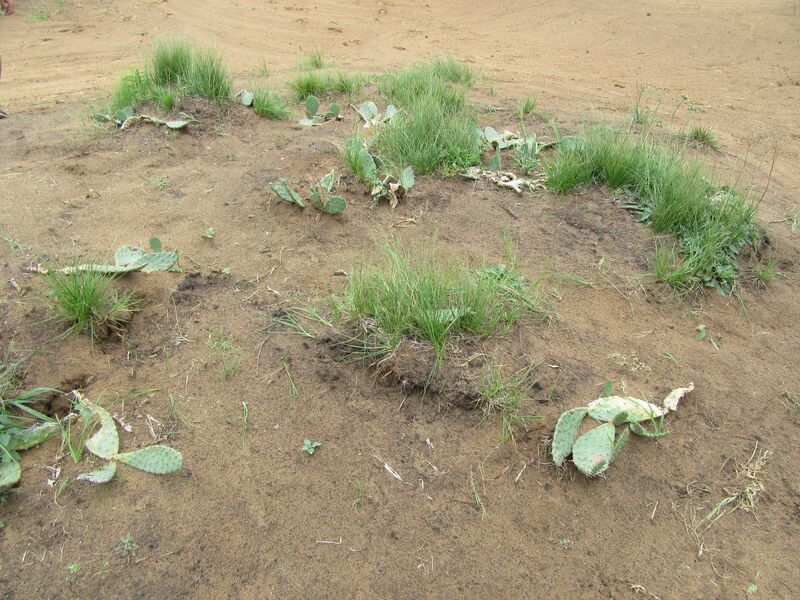 Take, for example, the batches of prickly pear cacti found growing on nine – who knew cactus grows naturally in Wisconsin? 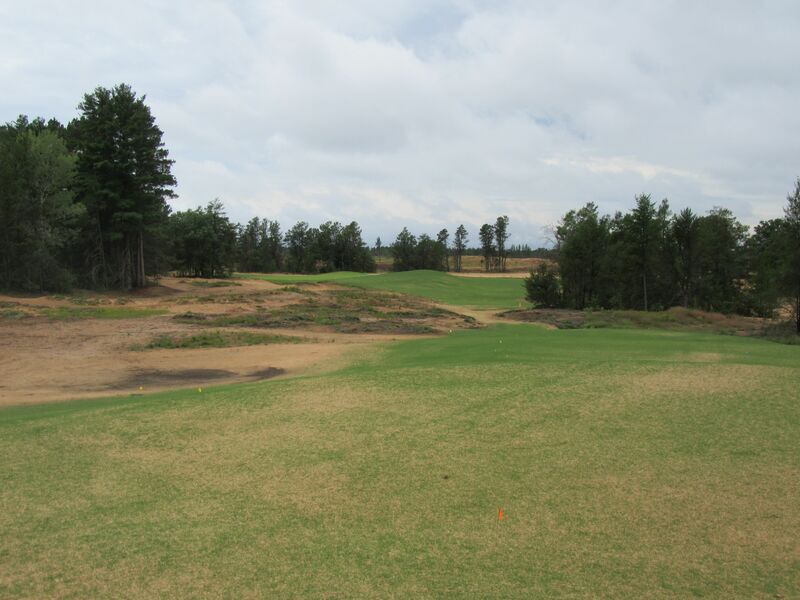 Heathland courses have some trees – more than Erin Hills, the Straits course at Whistling Straits, or Chambers Bay – but do not smother with them. 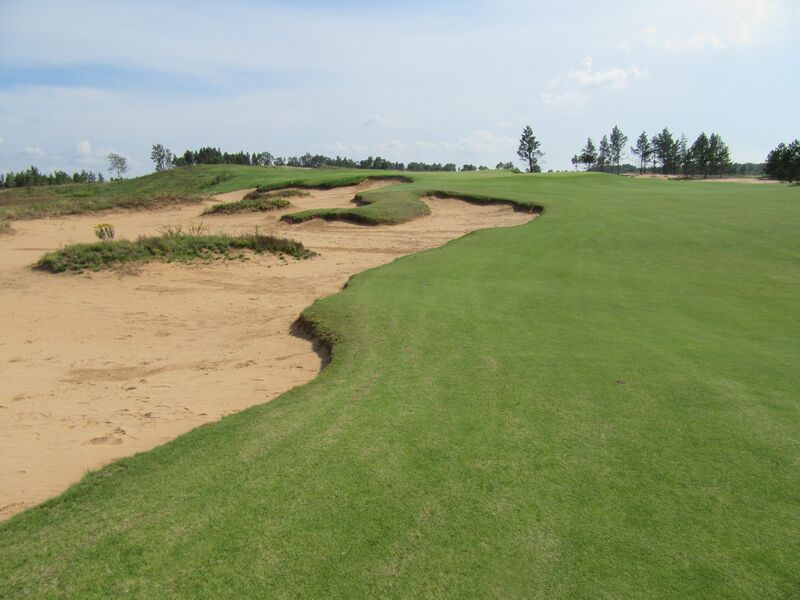 The key defenses against par tend to be sprawling wastelands, deep sand traps, undulating greens, run-offs and green-side collection areas. When the course is fully grown in, KemperSports Executive Vice President Gary Binder advises that Texas wedges (putting from the fairway) will be almost preferred as tight lies can otherwise make short wedge play overly challenging if not used to similar fescue conditions (I am still having nightmares about short wedge approaches from the heavily undulating green-side areas at Old Macdonald!). 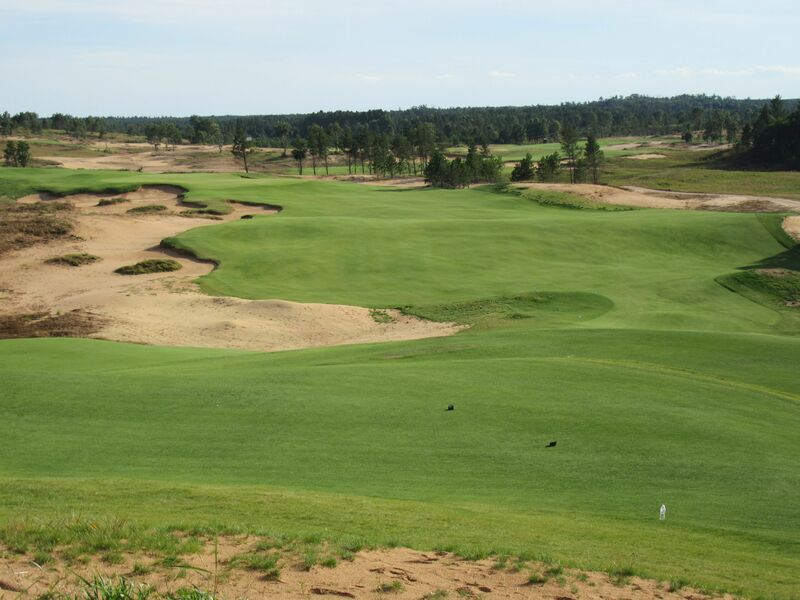 Sand Valley’s promise to be fast and furious will be overseen by one of the Midwest’s most accomplished superintendents for impeccable course conditions, Rob Duhm. 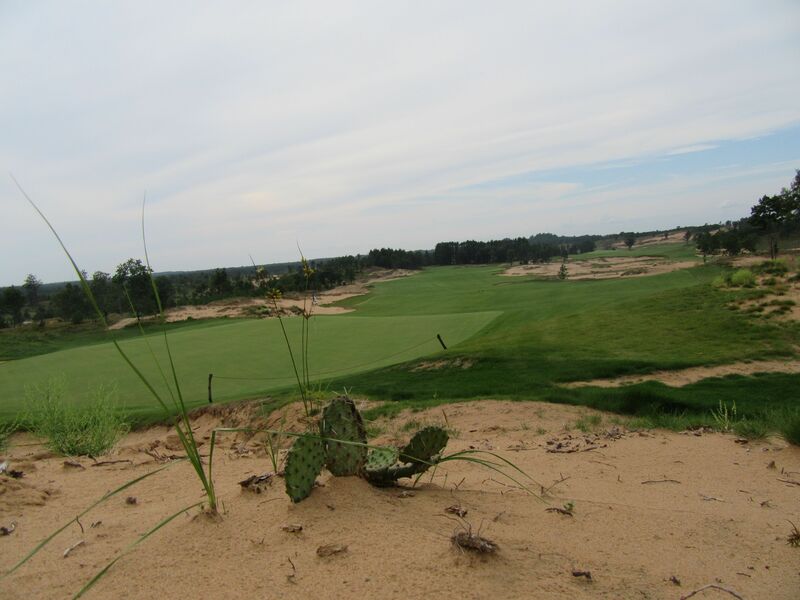 Rob joined the Sand Valley team this summer after being Superintendent at the Kingsley Club in Kingsley, Michigan (GolfWeek’s number 18 ranked modern course in America). 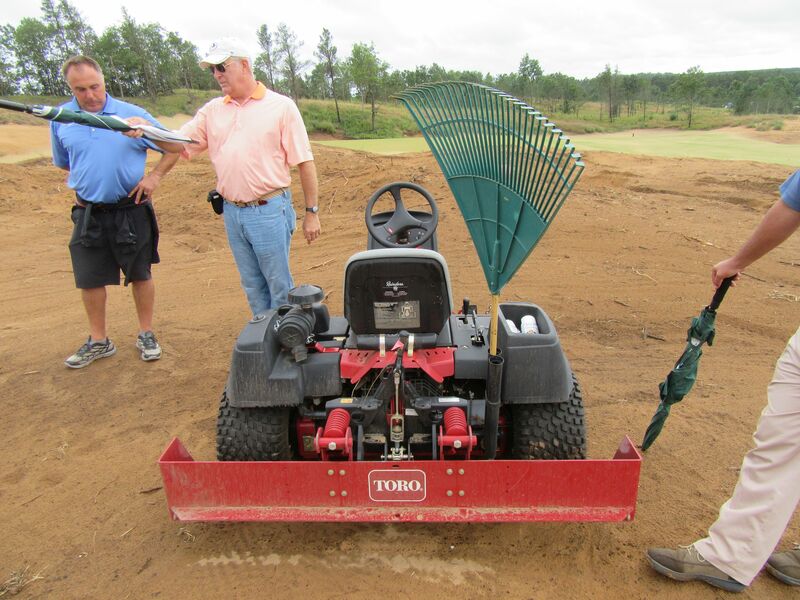 Nobody values the relationship between designer and superintendent more than Bill Coore does. “How do you know when a green is right? Take, for example, the 18th on the Red course at Streamsong?” I asked Bill. Coore/Crenshaw’s relationship in course design is one of give and take. Their principal role is conceptual, and they entrust many of the details to their loyal and talented team. Bill and Ben start by providing guidelines with a wide focus and broad concept, then let the land guide the process. When something one of their employees is working on is coming together, and they like it, they are encouraged to bring in Bill, Ben and the others to find the right way to complete it. While they provide the conceptual foundation, help with the labor and of course have final approval on design/implementation, they also understand that sometimes the best things happen unexpectedly, and encourage their team to recognize when that is the case. And the 18th at Streamsong, with it’s dramatic false front-right and right side? “I asked [the superintendent], ‘Can you and your team mow this? '” “We can mow this,” he told Bill. If he’d replied anything else, that tremendous finishing green complex would not exist as it is today. The Sand Pro cuts down centimeters (millimeters?) 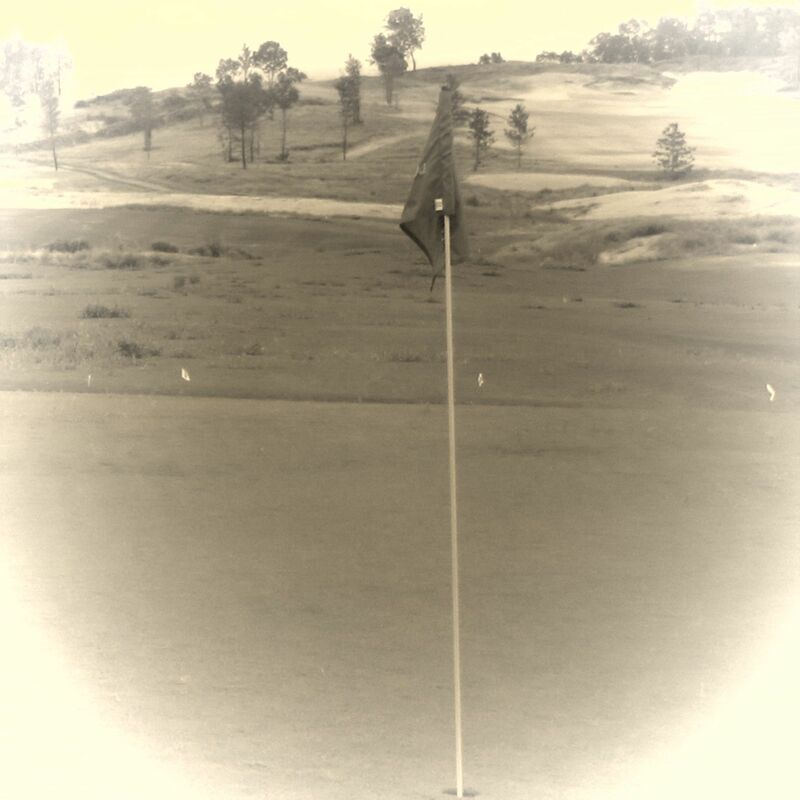 of terrain at a time, and while it sounds like a painstakingly long and arduous process for someone as accomplished as Coore, it exemplifies his commitment to teamwork and to providing his best efforts for an outcome that will not just suffice, but will wow the golf enthusiasts who will experience it long after. With dedication like that, there is no doubt in my mind that in 2017 this course will live up to the world’s lofty expectations of it. Even now, with only the majority of the front nine seeded, there is evidence everywhere that Sand Valley will be truly special. The resort will open with Coore/Crenshaw’s flagship course in 2017, along with 40 rooms for lodging. 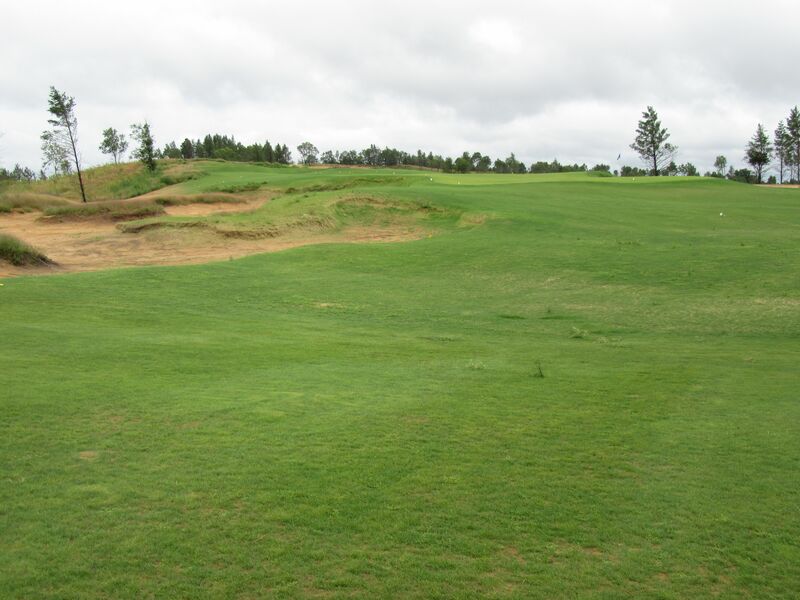 There will be a simple clubhouse and restaurant to start, which will be located by the start and finish of David McLay Kidd’s course, just downhill from “The volcano” and adjacent to the property’s lone body of water, Lake Leopold. 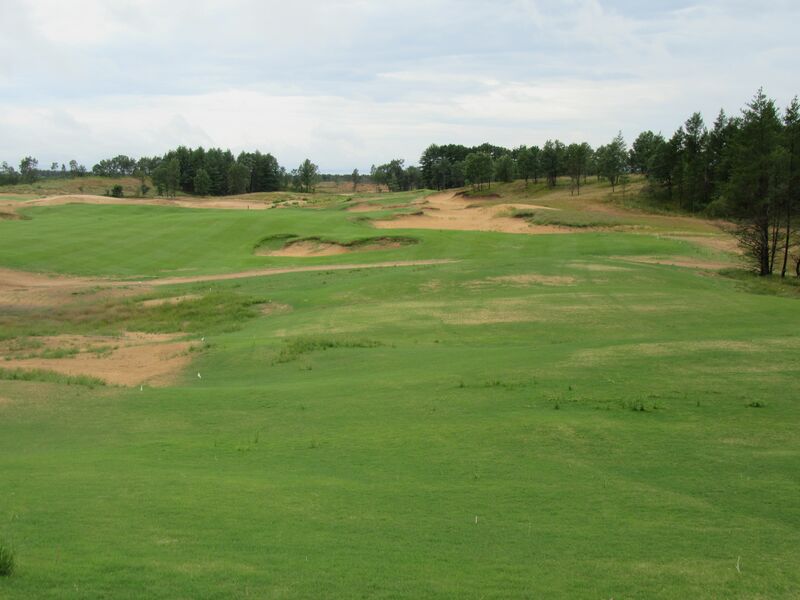 While the original course is slated to open to its 129 “Founders” in 2016 and to the general public in 2017, McLay Kidd’s course is scheduled to begin construction next spring. 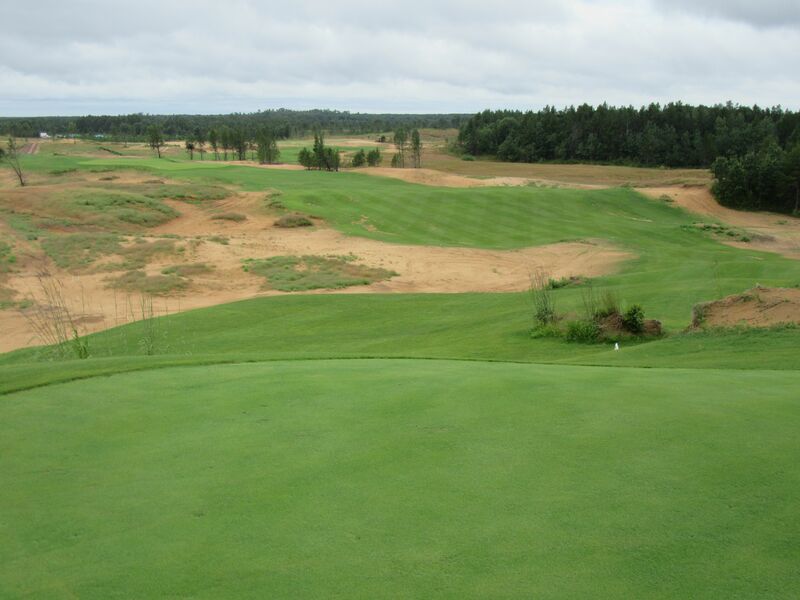 Fans of Keiser’s past work should notice the similarities here between Sand Valley and Bandon Dunes, which was McLay Kidd’s breakout project at that resort’s pilot course (and the country’s number 7 public and 8 modern course). Another 40-60 rooms will be added if the initial course is successful, and the golf resort will [hopefully] continue to grow from there. 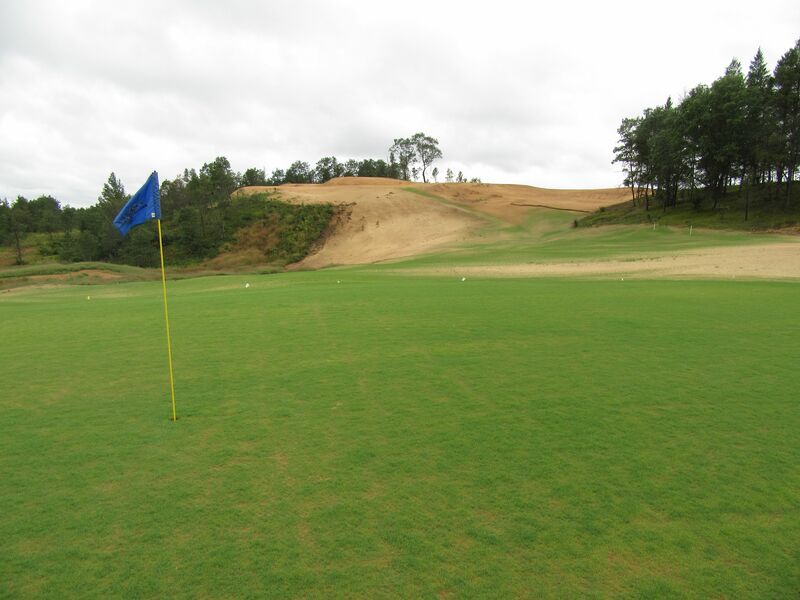 Similar to the resort at Bandon Dunes, lodging will be spread throughout the property to provide unique experiences for return golfers. Also similar to Bandon Dunes, lodging is planned to be comfortable and welcoming, with everything golfers need to wind down their day on the links. A comfortable bed, big bar of soap and great water pressure are a few of the key elements that go in to Bandon Dunes/Sand Valley style lodging, and of course a variety of pubs and restaurants to spend their down-time. Also similar to the Bandon Dunes Golf Resort, free shuttles will be provided to visitors to make their way around the property. 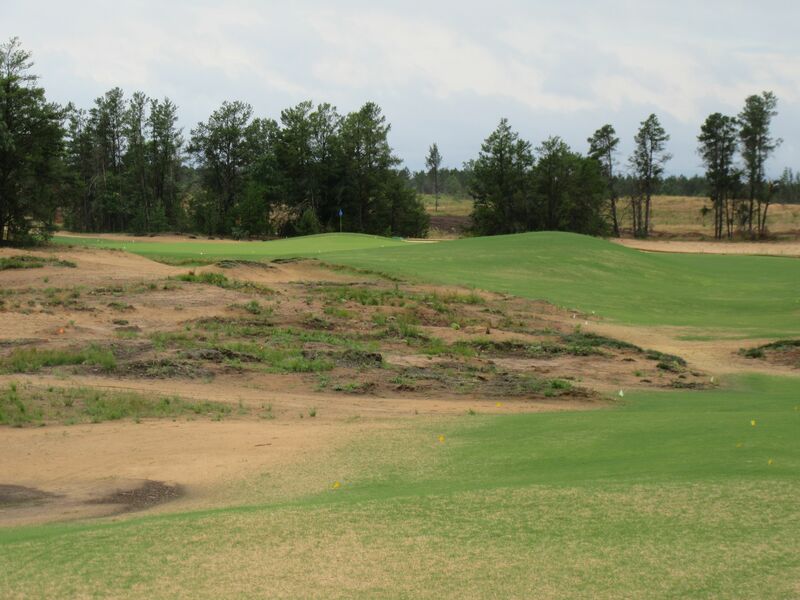 The front nine will begin from “The Volcano,” one of the most highly elevated spots on the entire Sand Valley property. The practice green abuts the first hole tee boxes, and will actually include the two farthest tee boxes on separate plateaus of the putting green complex. 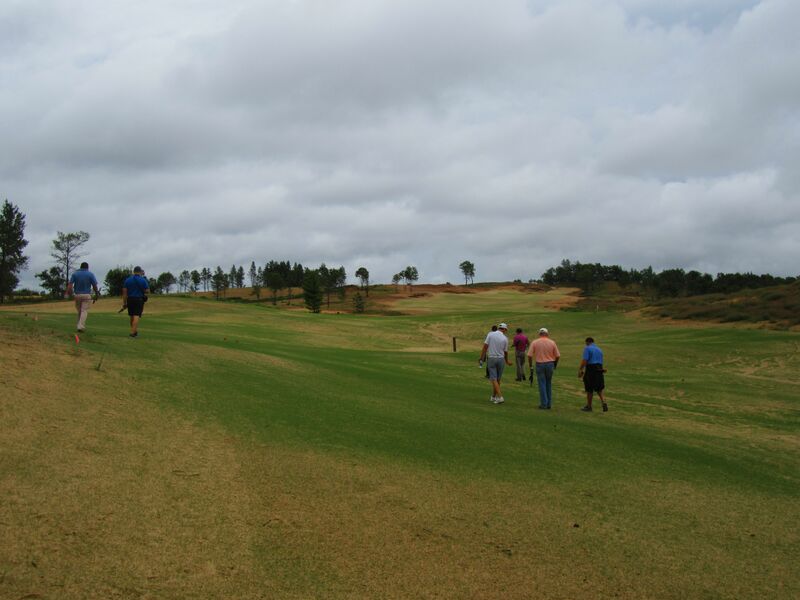 This is one of the most beautiful areas on the entire property, and will provide an immediate “Wow” moment for golfers teeing off from these highly elevated tees on one. The first hole fairway runs from right to left, and uphill to a large green with a false front and plenty of hole location options. 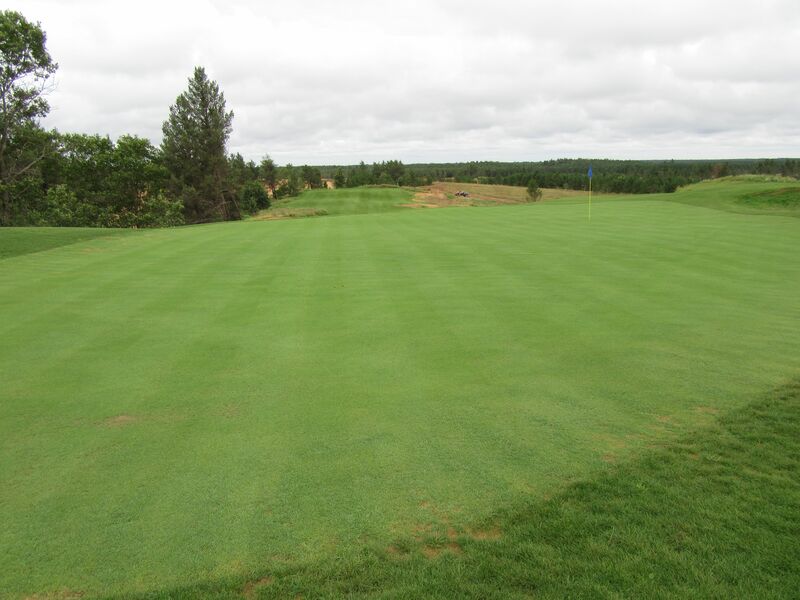 The greens at Sand Valley will be large, in general, averaging between 10,000 to 12,000 square feet with some considerably larger. 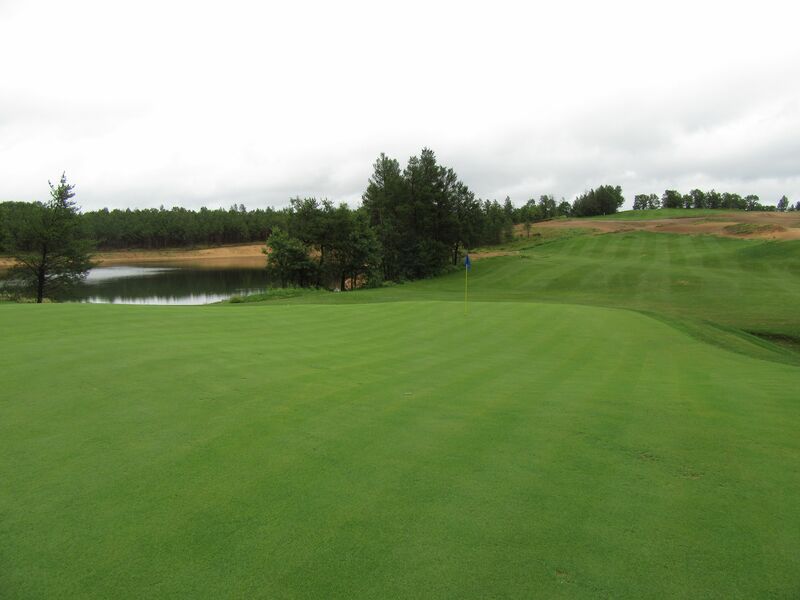 Green contouring is planned to be fairly subtle, to keep the course fair and enjoyable to players of all skill levels. 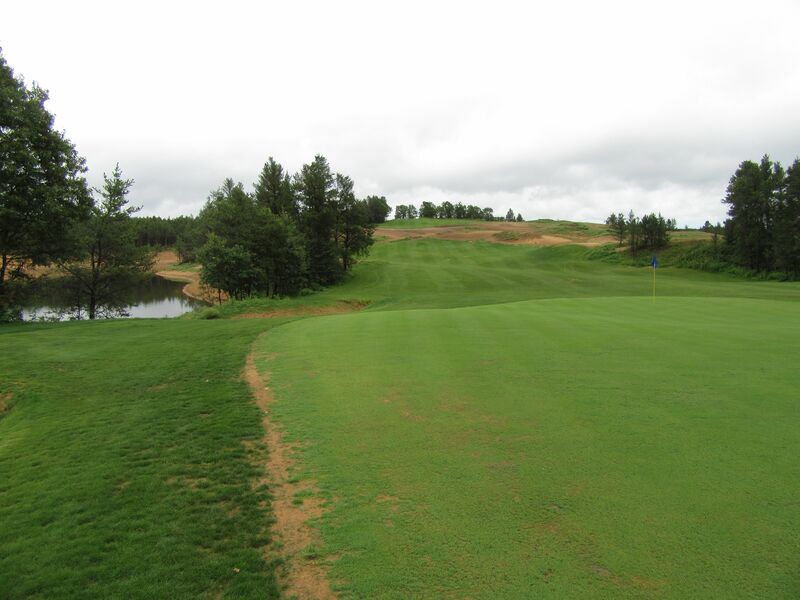 The second hole at Sand Valley Golf Resort will be a real thing of beauty: A straightaway tee shot will give way to a dogleg right with an uphill climb. The tee shot should be played toward the wasteland straight away, and will need to carry the traps right to have a realistic approach to the green. 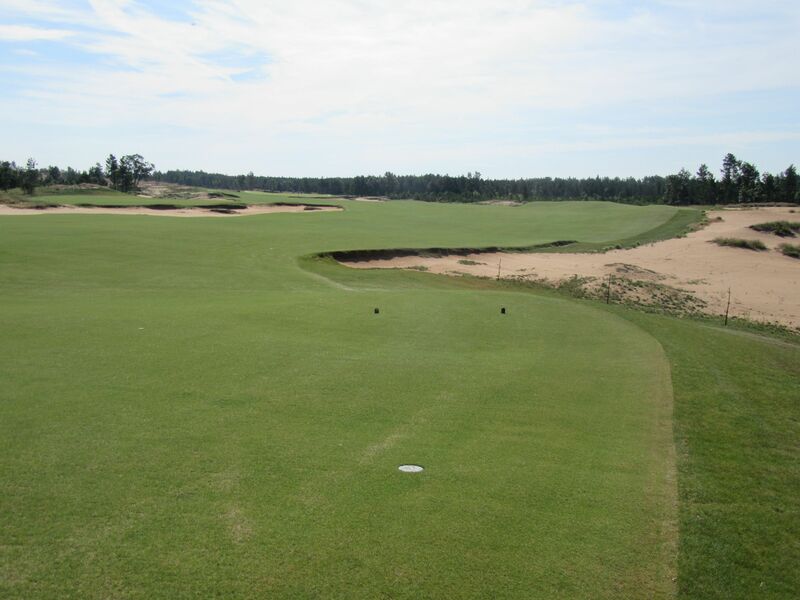 The third is the first par three to be played on the Sand Valley course, and will be the longest of three on the front nine. Just right of the green is a barren sand site that was once inhabited by local settlers. This area, completely stripped of minerals and anything capable of growing vegetation, is pure unadulterated sand. 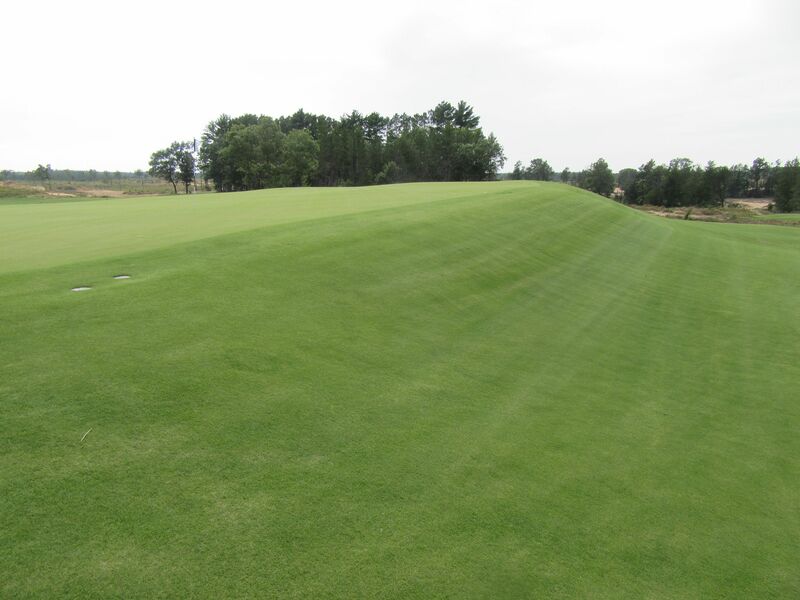 The fourth will be a par five that plays longer than the 550/510 suggested on the preliminary scorecard – uphill the whole way, great approaches will be needed to stick this green with its massive false front. The fifth will be a stellar downhill, mid-length par three. 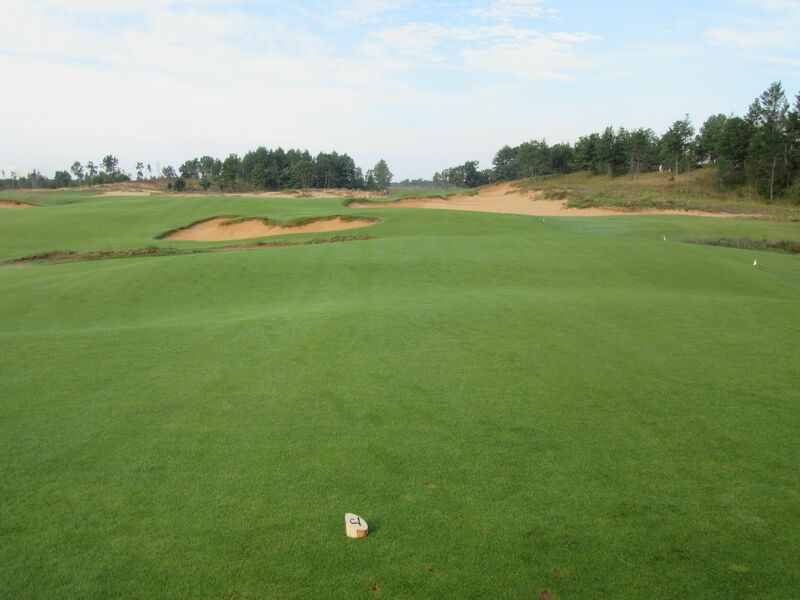 You will notice in the collection of par threes being built at Sand Valley that no par three is similar to another. In the third hole, there is a long par three with a mound to the right that will both hide that side of the green and help run shots on and leftward. The fifth is a mid-range downhill one-shotter, and the eighth is a short uphill par three with a heavily sloped green. Nothing is worse than playing the same club over and over on every par three, and Coore/Crenshaw recognize this and have added in plenty of variety. Everything off of the green will be collection areas, so hitting and holding this putting surface will be crucial. The longest par four on the front nine, the sixth will be an incredible golf hole. With a fairway that runs downhill off the tee, the right side will be most inviting to long hitters, but the left side will allow for the best run-out and eventual approach shot. Waste bunkers will be everywhere, forcing players to pick a side before teeing off. 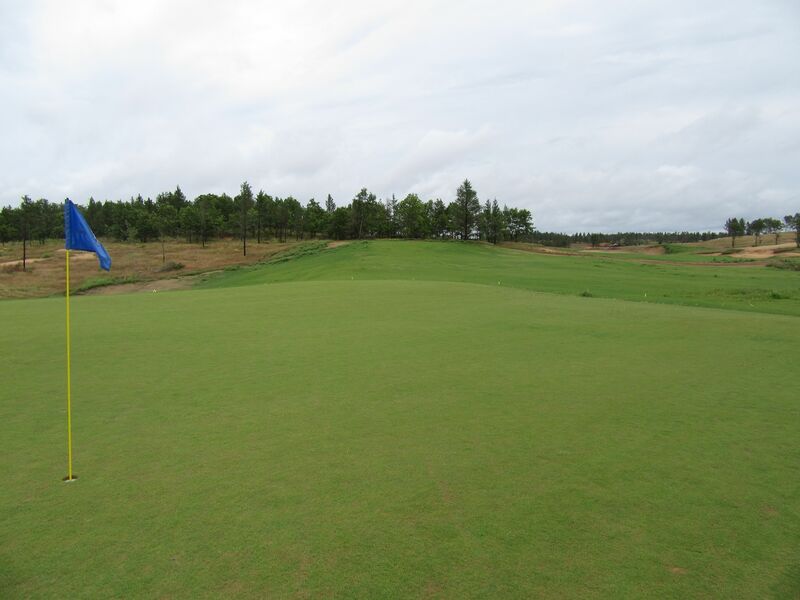 The green on six was the largest we saw on the front nine at Sand Valley. Seven, although not a double dogleg hole, may play somewhat like it. 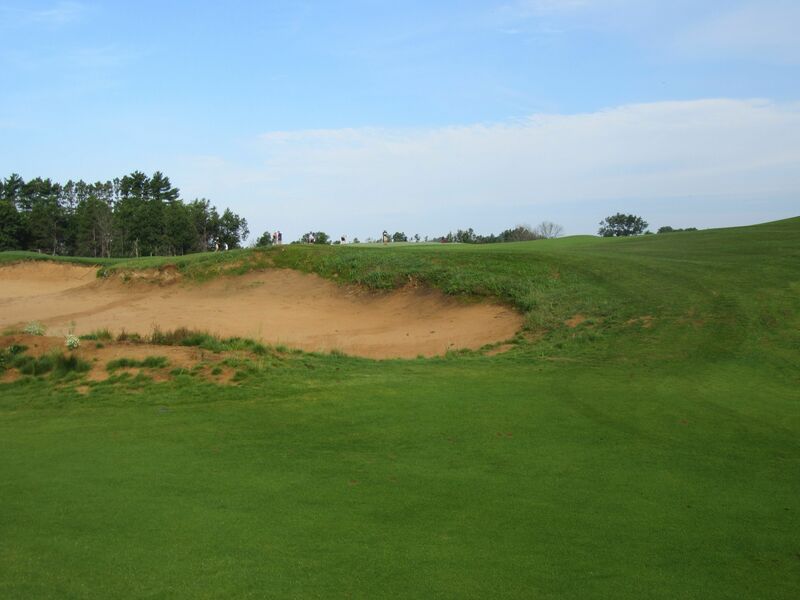 The initial tee shot will play out left of a gigantic waste bunker, then veer slightly right before coming to a left-to-right cross bunker that will encourage shots to the second fairway left of it, or else to stay right or carry it on the approach. Bill Coore’s favorite holes in golf to design are the shortest ones: Reachable par fours and especially short par threes. Why? “Because on a short par three, everyone has the opportunity to beat even the best player in the world.” Jordan Spieth will still get his shot closer than a 20-handicap most of the time, but there is always that chance for greatness to players of all skill levels. It only takes one great shot. 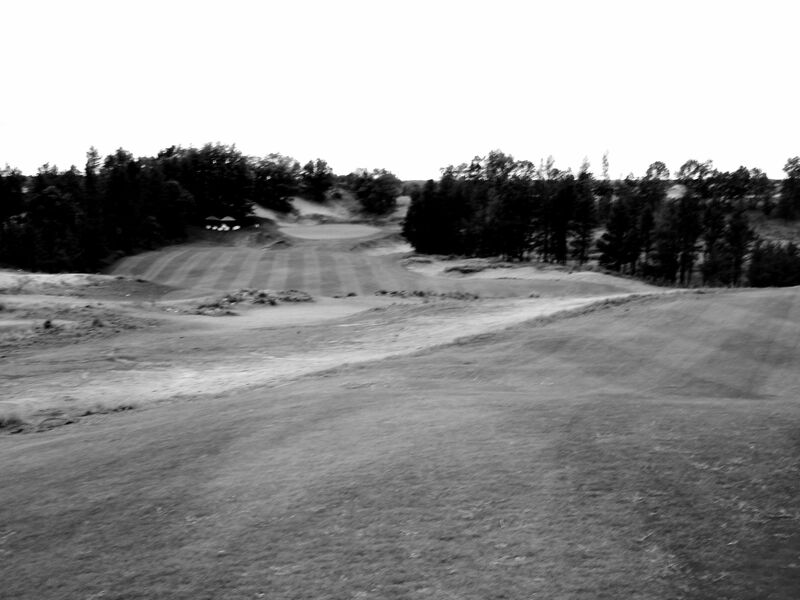 Eight is a magnificent uphill par three, and was our first chance to hit balls at Sand Valley. Playing from 138 yards, the wind was slightly in our faces and the green is highly elevated. The shot was playing more like 165, and for me was a smooth seven-iron. 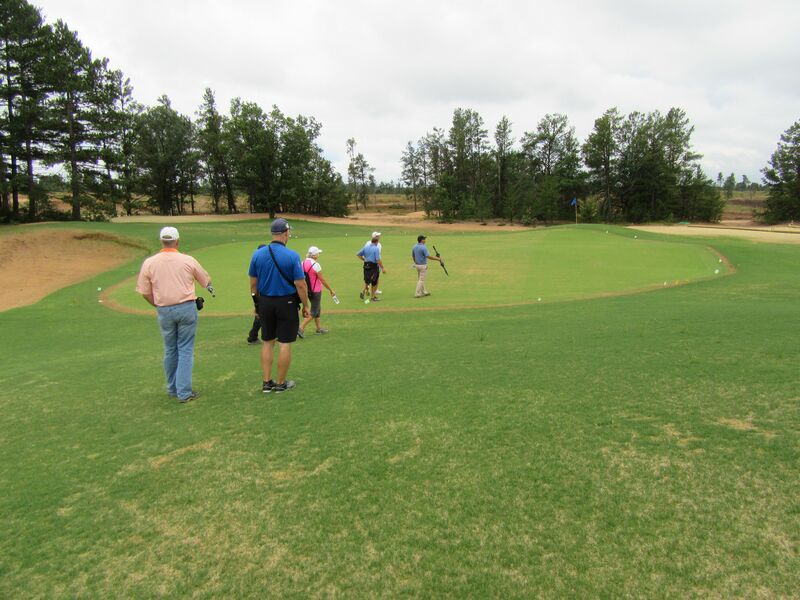 While nobody hit the green the first time around (we all blamed it on using other peoples’ clubs, of course! 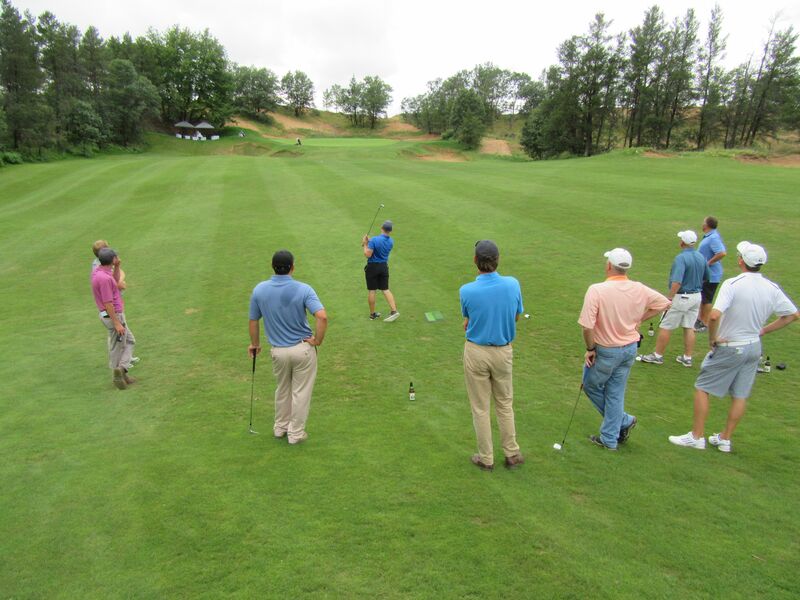 ), several of us did hit it on our second attempt and I found a way to edge out Glen Turk for the course’s inaugural closest to the pin competition. Speaking of short par fours, the ninth will be a great one. From highly elevated tees overlooking the Volcano and Lake Leopold, this is the one hole on the course where water can potentially come in to play. It will take a pretty well sliced ball, but it’s possible (similar to the par tree 9th at Erin Hills). The competition format on nine was a four-man scramble. KemperSports Director of Communications, BR Koehnemann, tossed all balls up in the air and the teams were chosen: It would be BR, Gary D’Amato, Brian Weis and me vs. Gary Binder, Glen Turk, Matt Saternus and Craig Haltom. My tee shot went left and found the woods (which will be cleared by the time Sand Valley opens). BR’s went long and straight, but rolled in to the deep front-left bunker. Turk’s ball found the same bunker, and we all agreed to find reprieve in the rough. From there, my flop shot stopped at two feet and we expected to be victorious. Turk, an excellent player, though, drained a great putt to tie. Two birdies, all square. Following the scramble we grabbed a beer and moved things back to 86 yards. 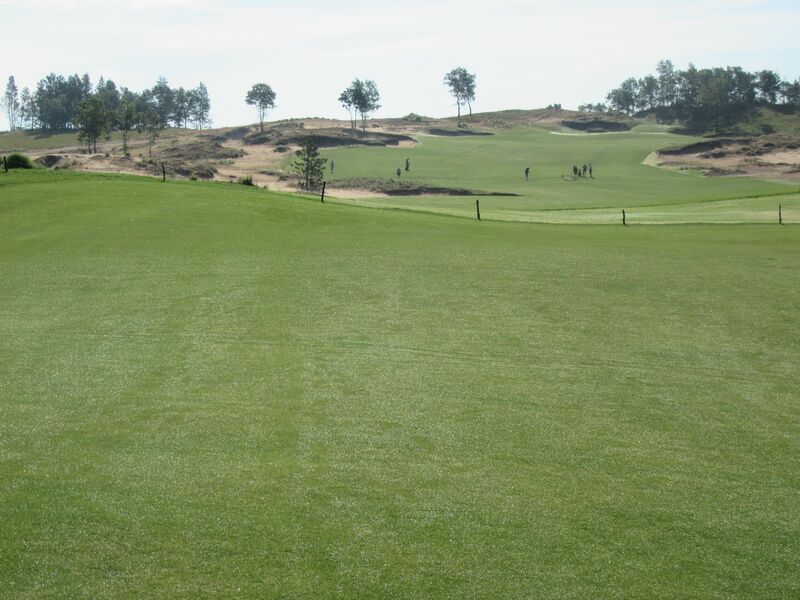 The traps left and right are certainly intimidating around this green complex – with the false heather covering, they do not show in pictures just how deep they are. They are deep, though, as better seen in the video of Binder’s bunker shot below. “When I walk off the 18th, I want to go straight to the first tee and do it again,” is Mike Keiser’s goal for the project. 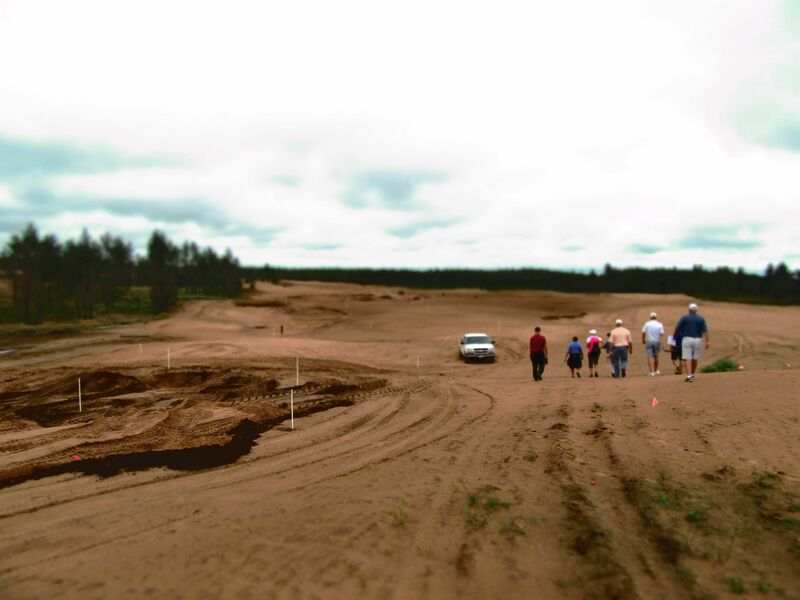 While the course(s) at Sand Valley will be walking only, they will be walkable to their key consumer: Folks who are going to pay to play them. At most premium courses like this, that typically means a slightly older golf enthusiast who has the disposable income to spend around $200 per round. 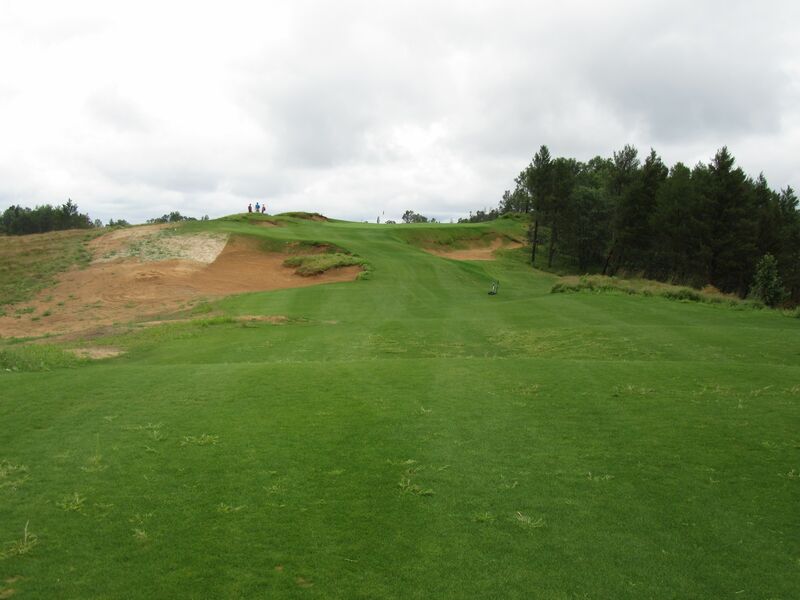 There are wilder and more woolly areas on the Sand Valley property than the one Coore/Crenshaw chose to build the property’s flagship course on, but the mixture of flat areas around the sand barrens, impressive dunes and hills as well as flattish and in-between areas was perfect for the walking golfer. The other key aspect as to why this parcel of the expansive land was chosen? “The Volcano.” The Volcano is the tallest landmark on the property, and oversees the rest of it including tall bluffs in the distance and the beautiful, meandering first hole fairway. 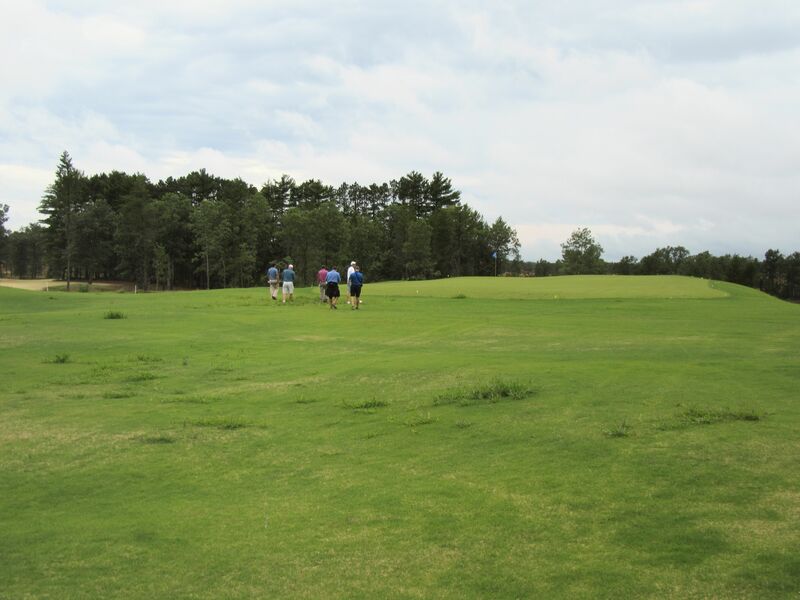 “We want to build courses on land that we would love to just go out and walk around, anyways, even if there was no golf there,” Coore told us. 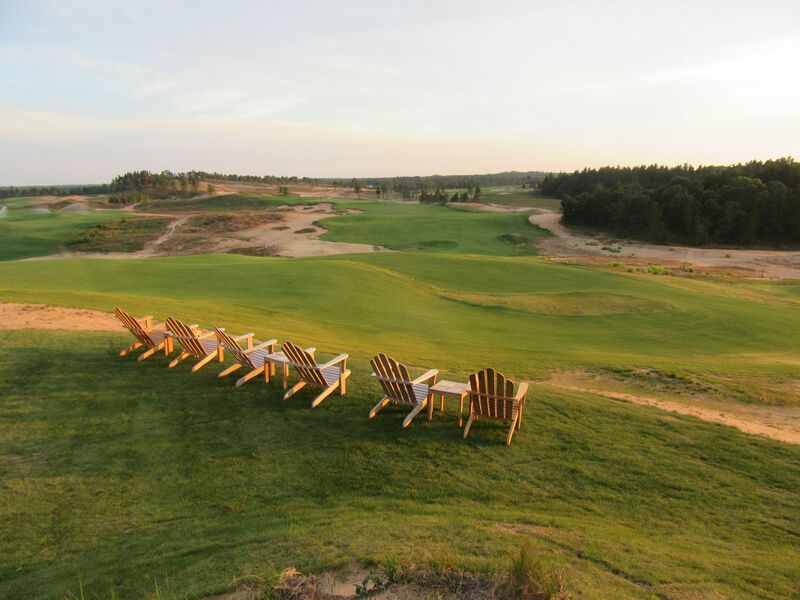 This is one of those properties, and golf enthusiasts across the world are already clamoring for 2017 and their first opportunity to experience this one-of-a-kind Wisconsin golf resort, Sand Valley.